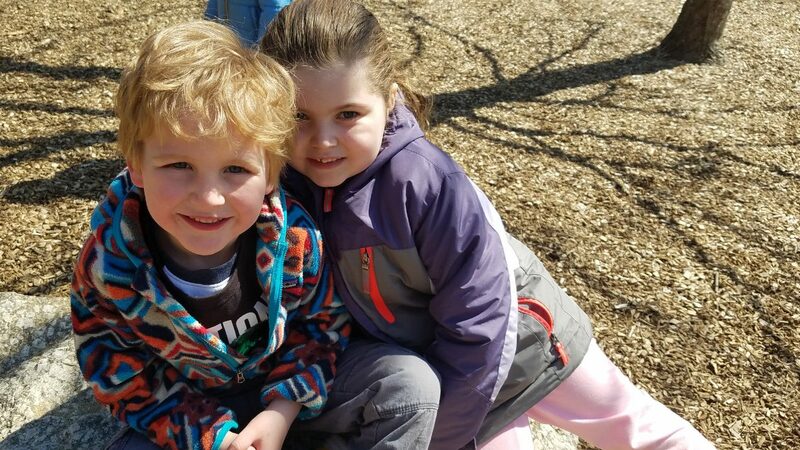 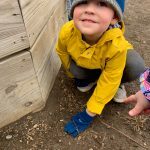 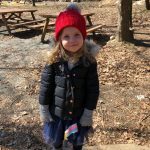 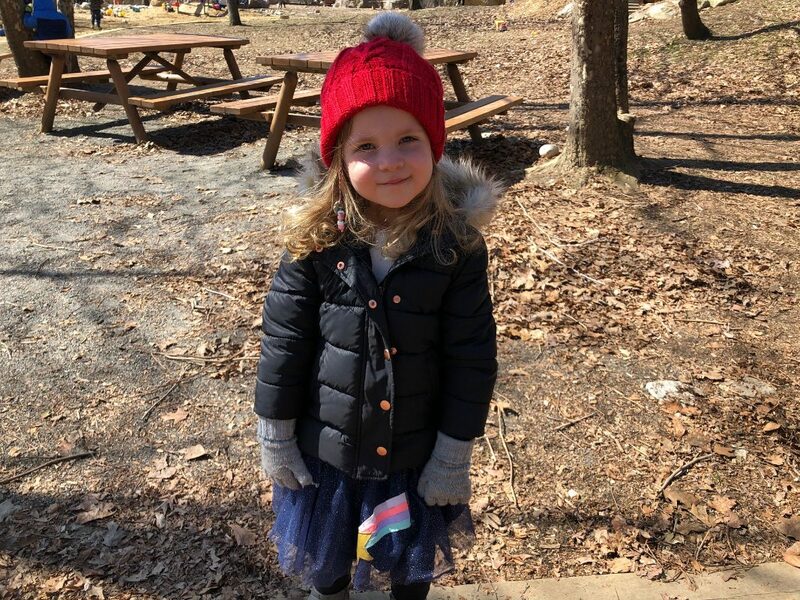 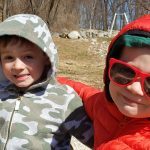 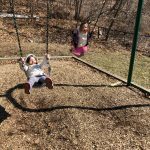 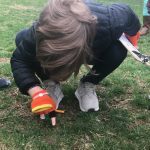 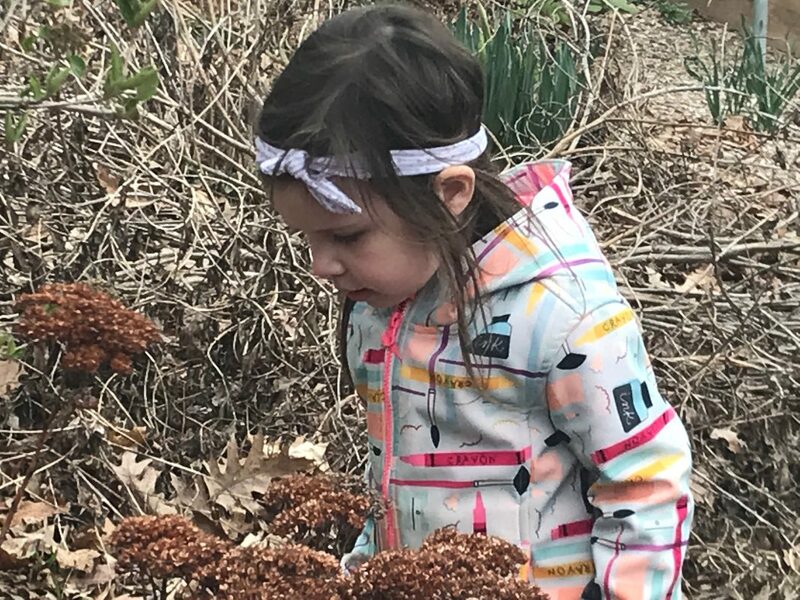 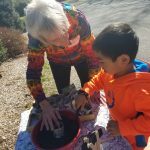 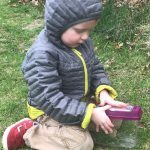 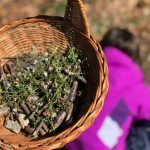 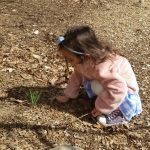 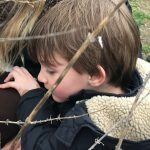 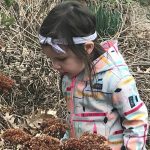 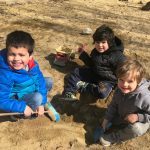 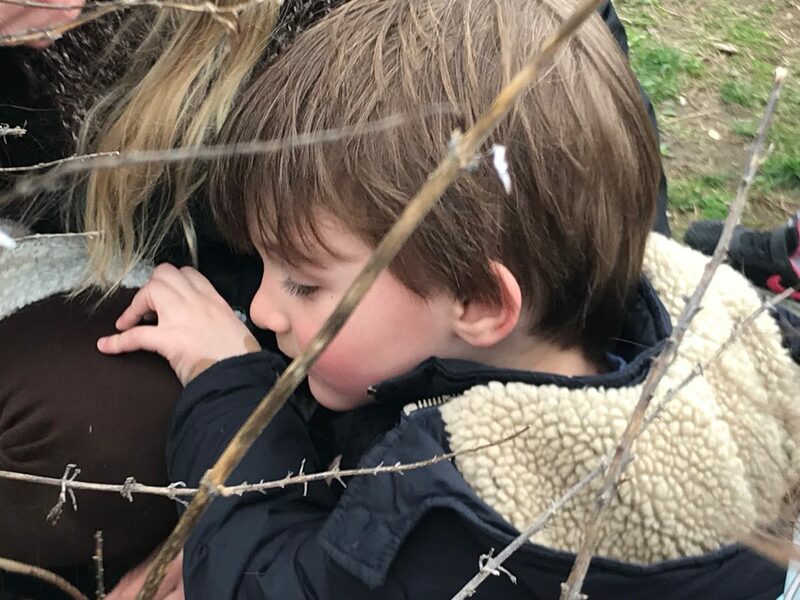 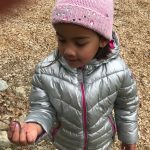 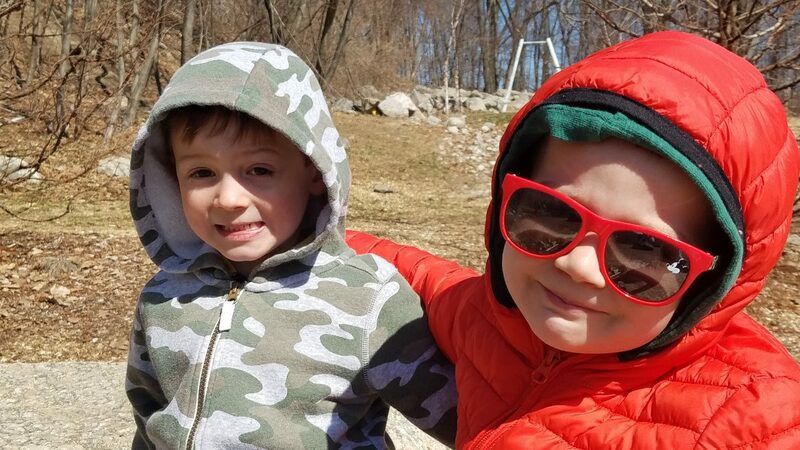 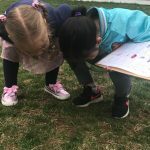 Spring is the perfect time to go for a nature walk and bug hunt and that’s exactly what we did yesterday. 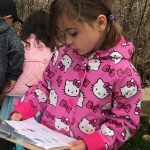 Going on a nature walk is simple and full of fun and learning. 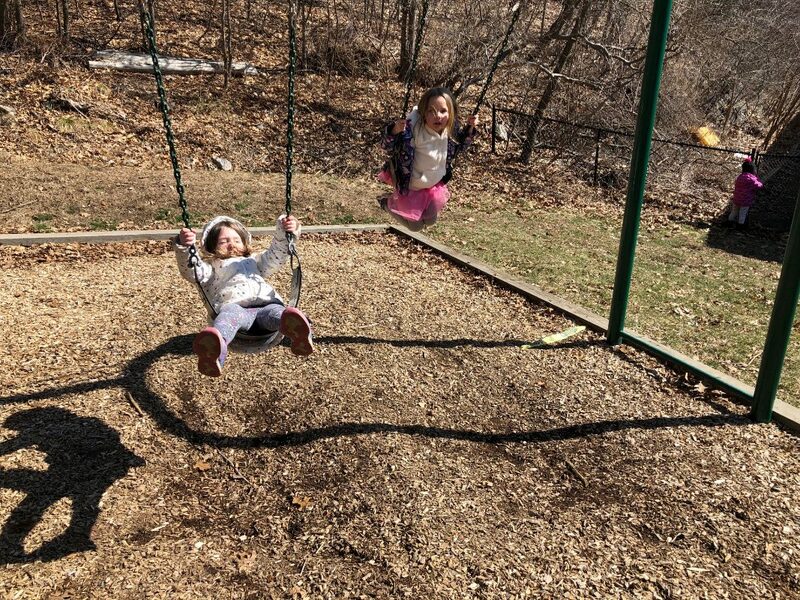 It’s a great way to spend time outdoors. 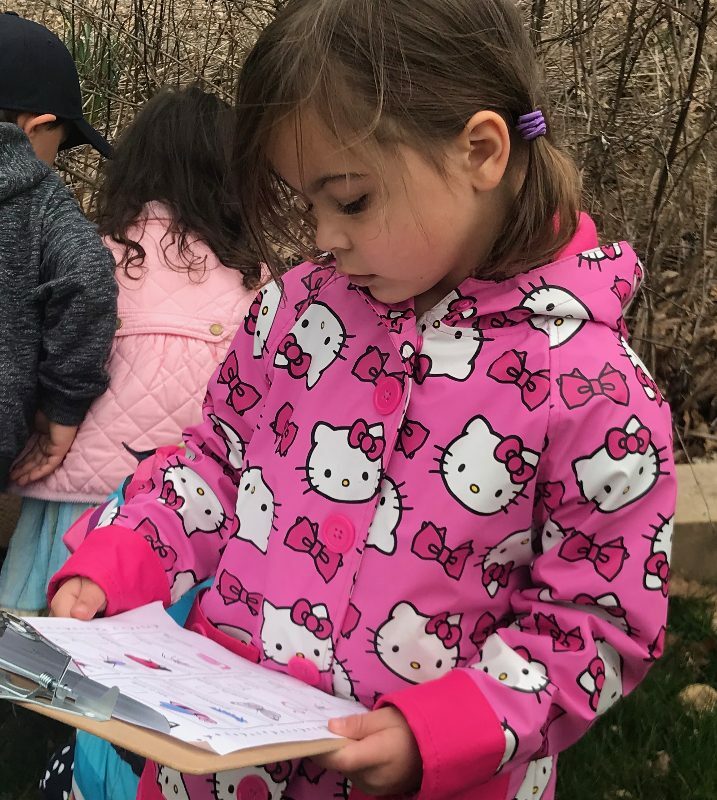 The secret to a great nature walk is time, lots of time to explore and discover. 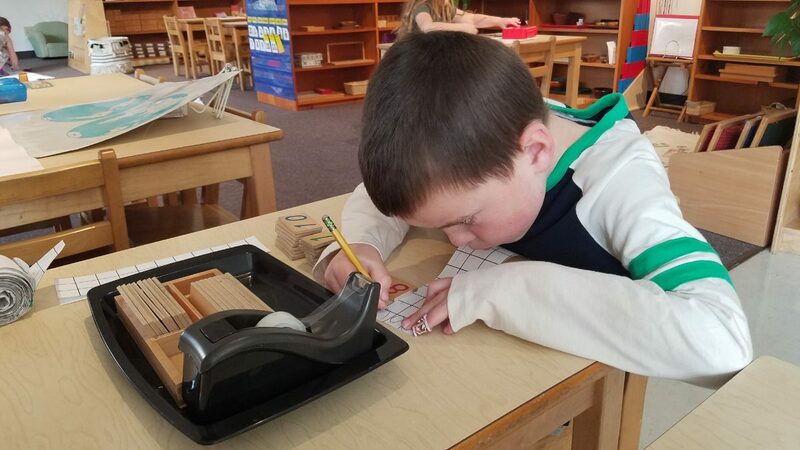 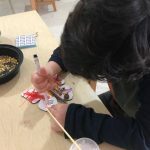 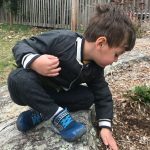 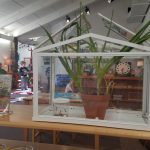 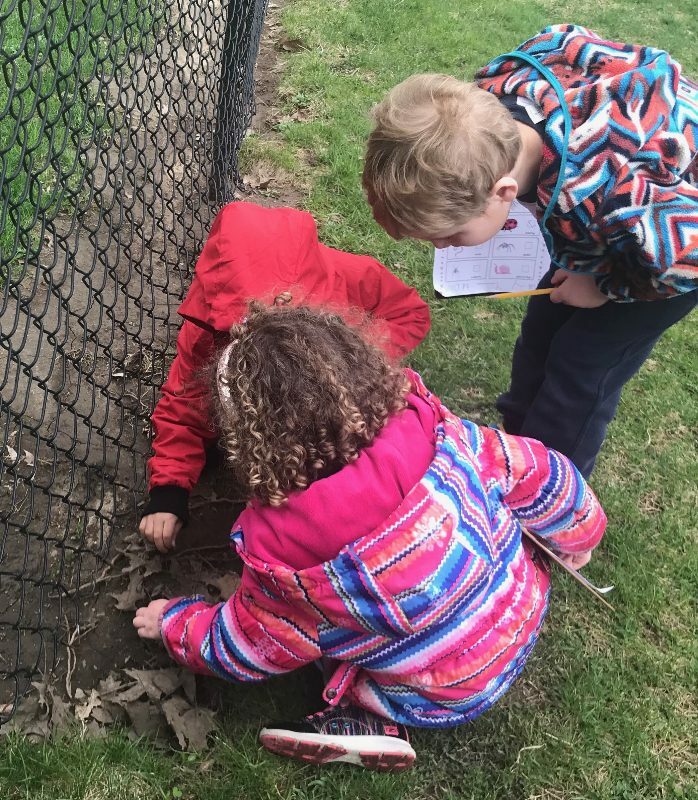 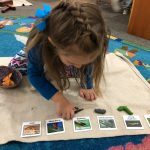 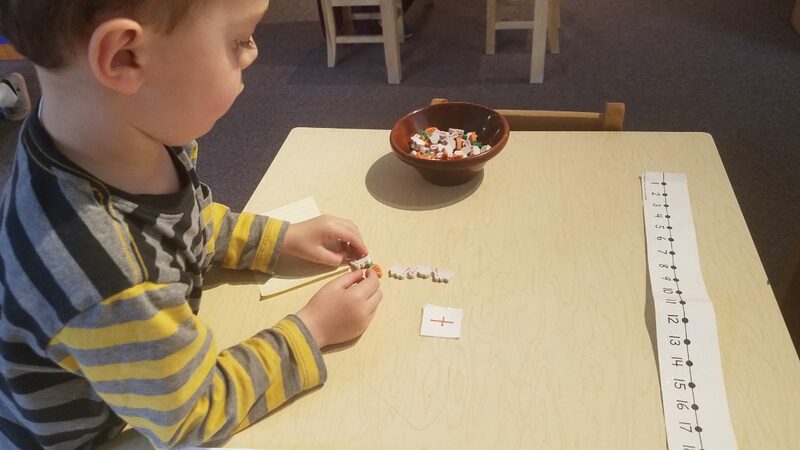 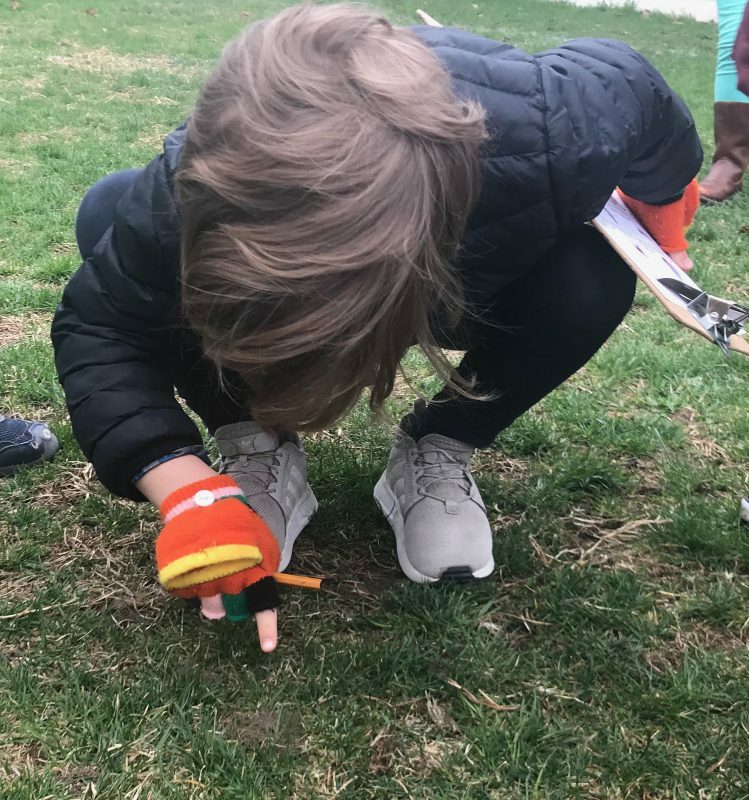 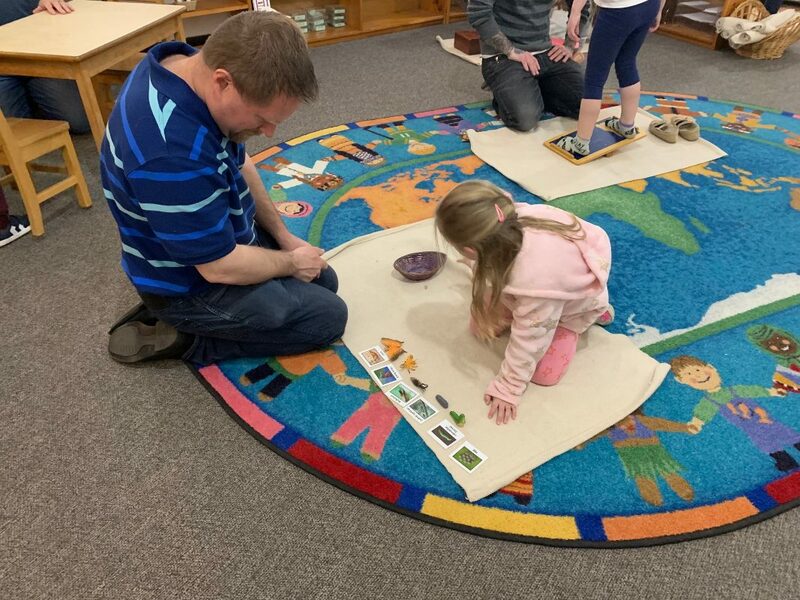 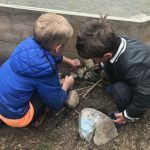 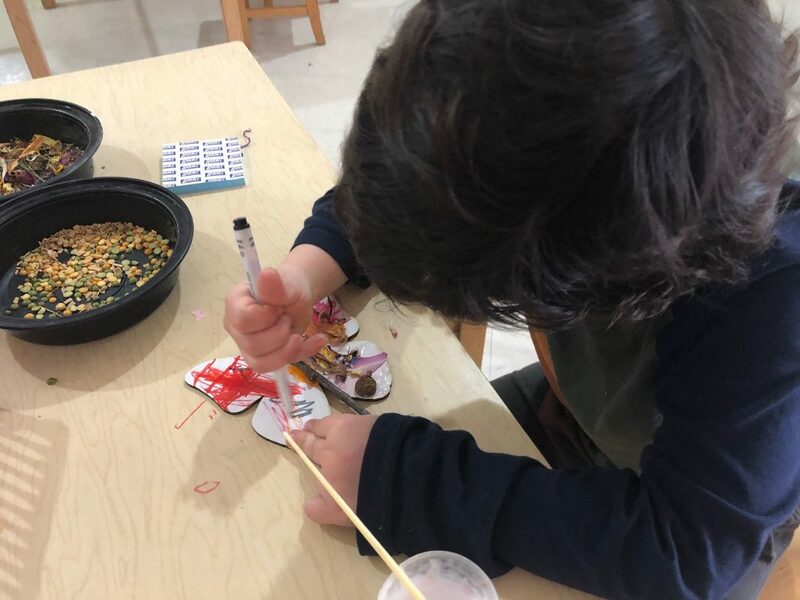 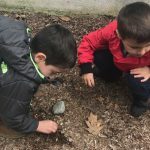 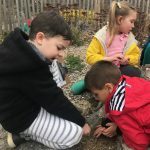 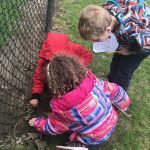 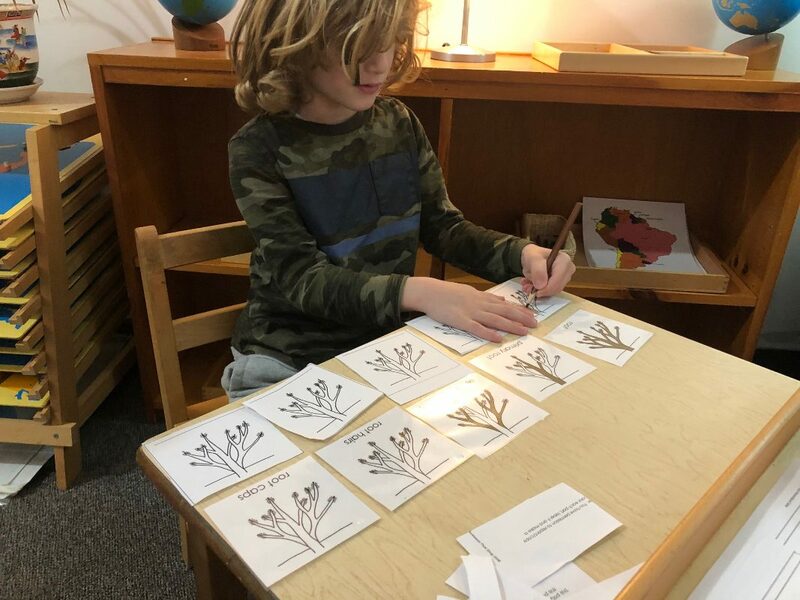 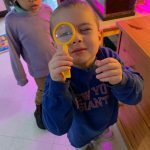 A bug hunt is a really fun way to help incorporate what we are learning about insects inside the classroom and what we would observe in nature. As we left the school to begin our walk around the perimeter of the school and see what insects we would discover, we were encouraged by one young friend yelling out “Come on entomologists, we have a job to do!” We had no problem finding insects that were hidden under leaves and rocks, however, flying insects were not to be found. 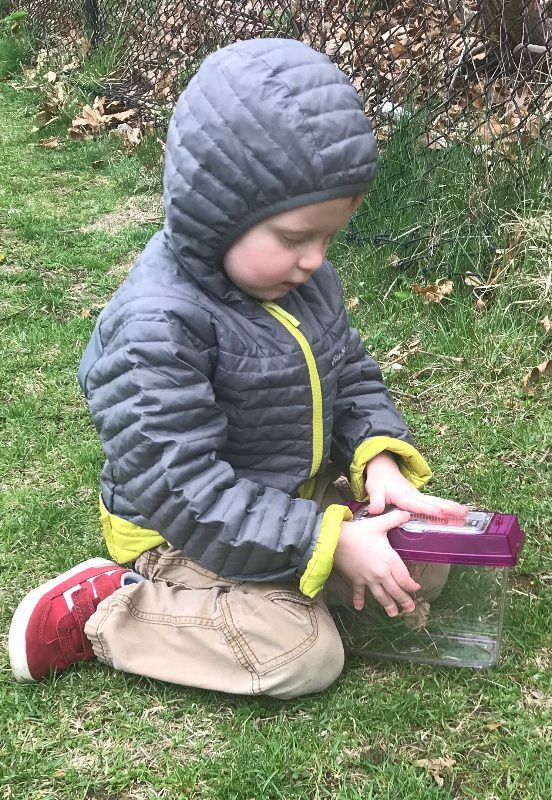 The general consensus is that it was just too cold for flying insects to be out. 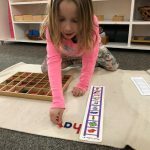 Mrs. Lyga and I strongly agree! 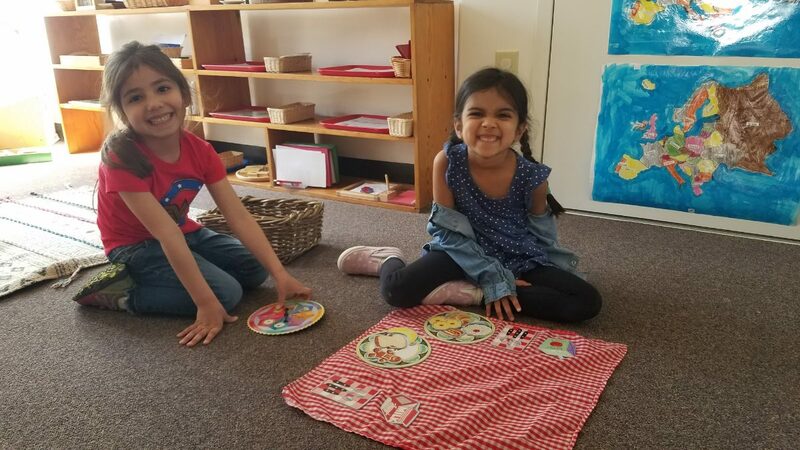 Ms. Kayser’s Class: Be Our Guest! 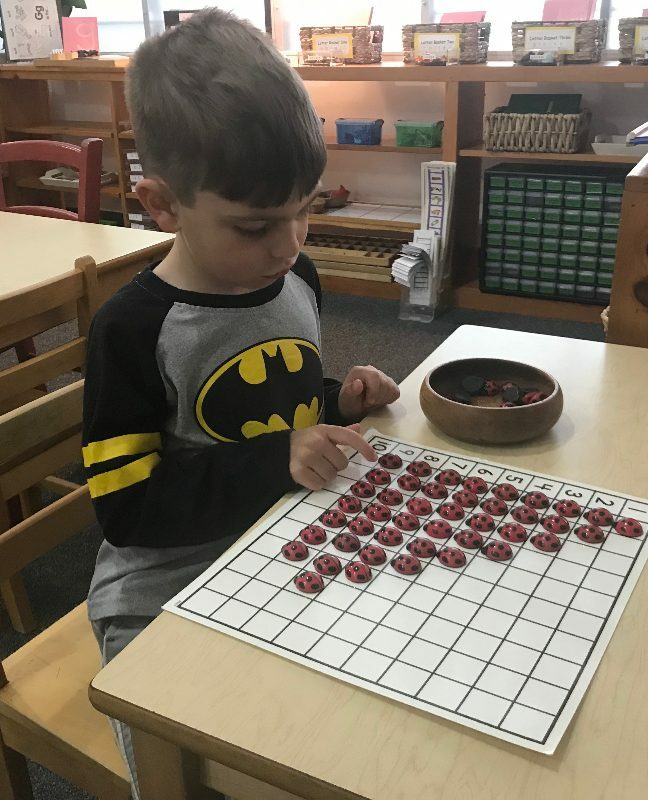 This week has been an exciting week for our students! 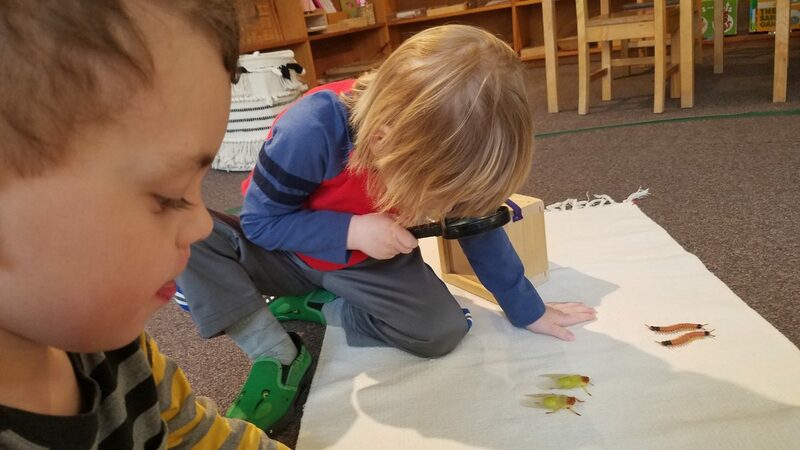 To start it off, the children came in on Monday to see that the caterpillars were indeed all spun into their chrysalises! 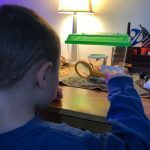 We carefully put them in the upright position in the tank and watched as they wiggled from the unexpected movement. 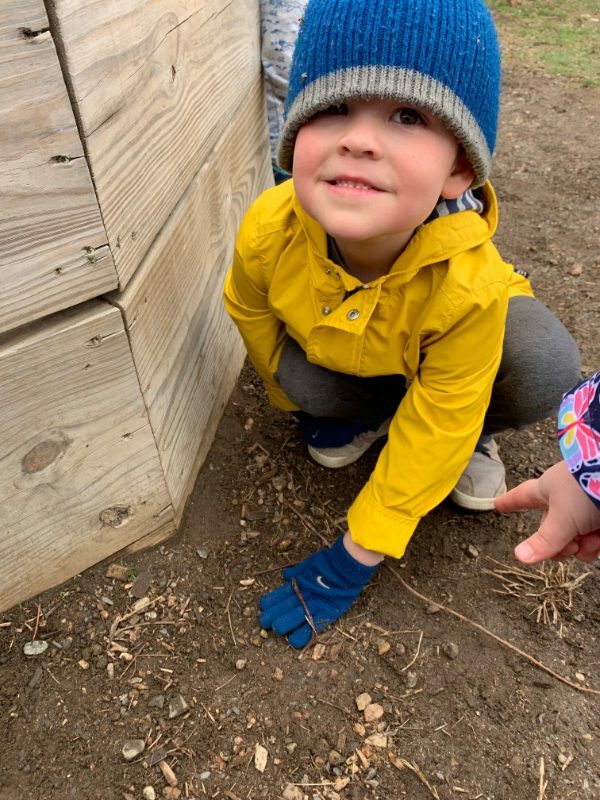 It was such a cool experience for the children to see them move around and prove they were in fact the little caterpillars we received just two short weeks ago. 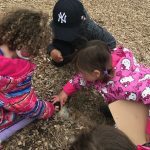 The children anxiously come into the classroom every morning to check on our soon-to-be winged friends. 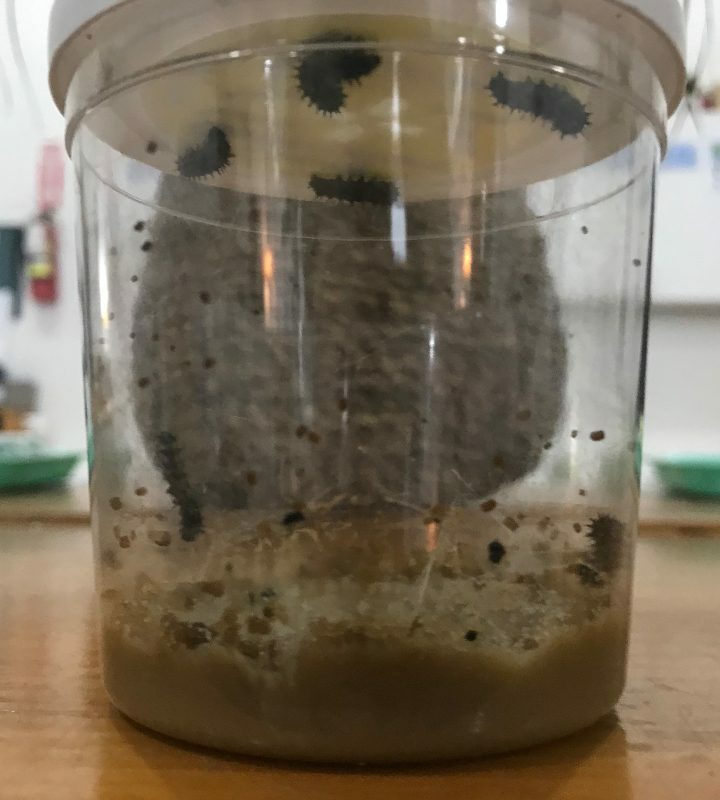 This Saturday marks seven days since they formed their chrysalises, so we may have a surprise waiting for us in the classroom on Monday! 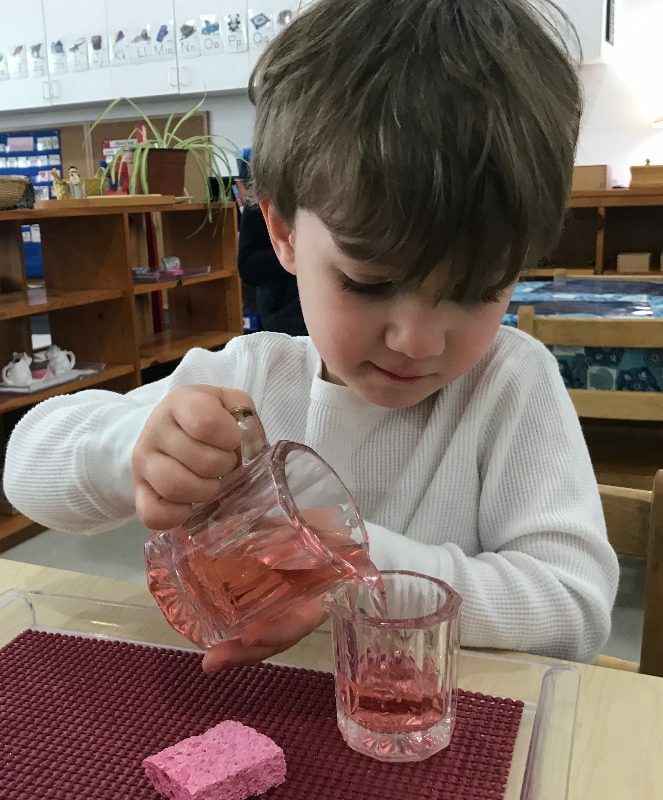 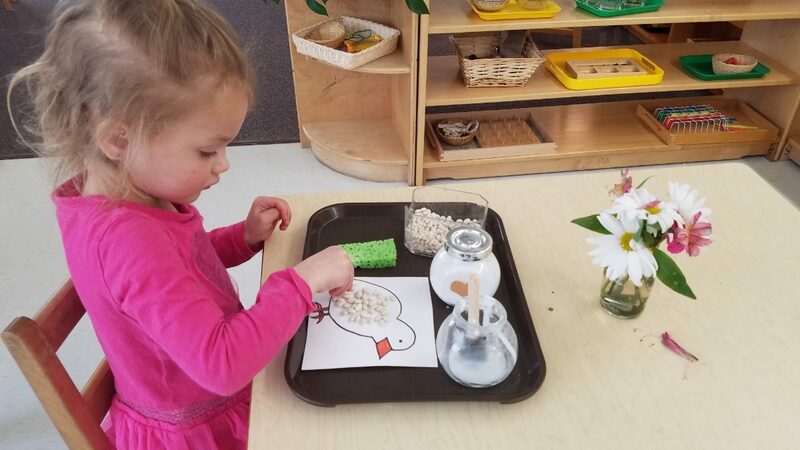 The children went outside on the playground and found a few flowers to place in the tank, and we will make a delicious drink of sugar and water to mimic the nectar of flowers in case they decide to come early over the weekend. 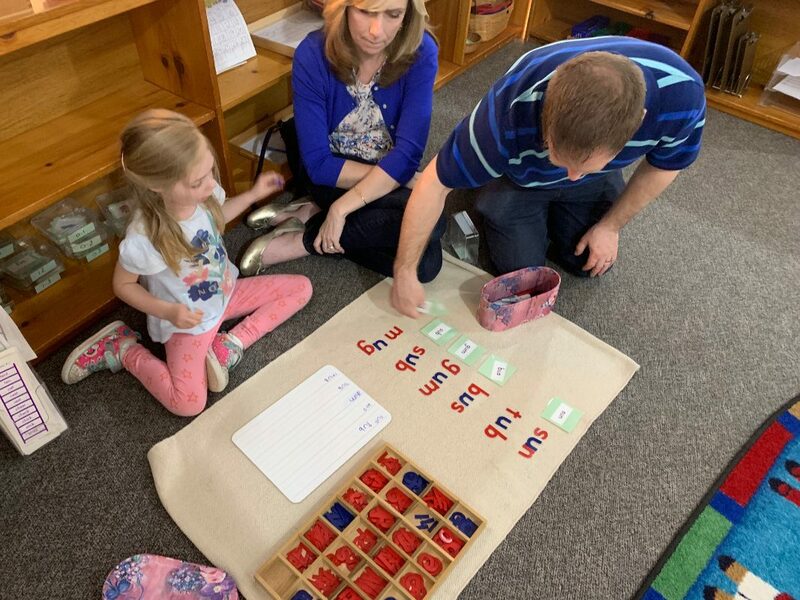 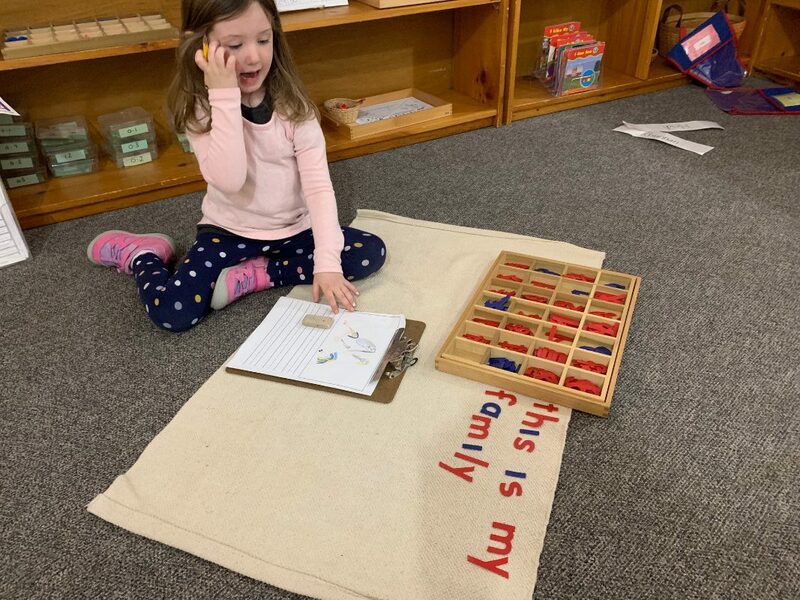 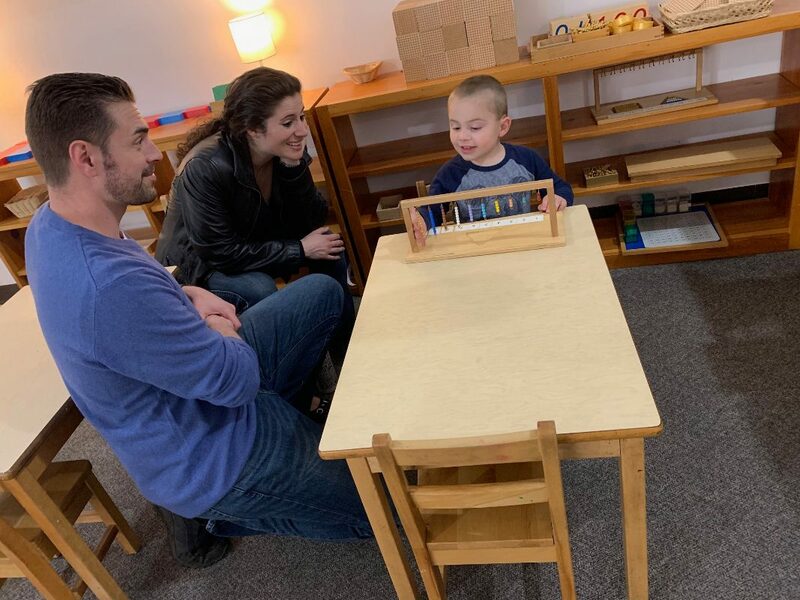 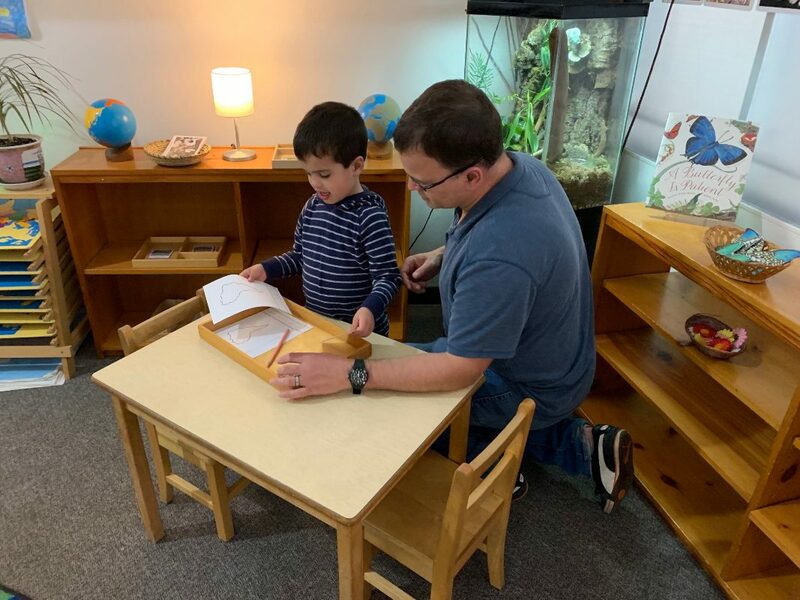 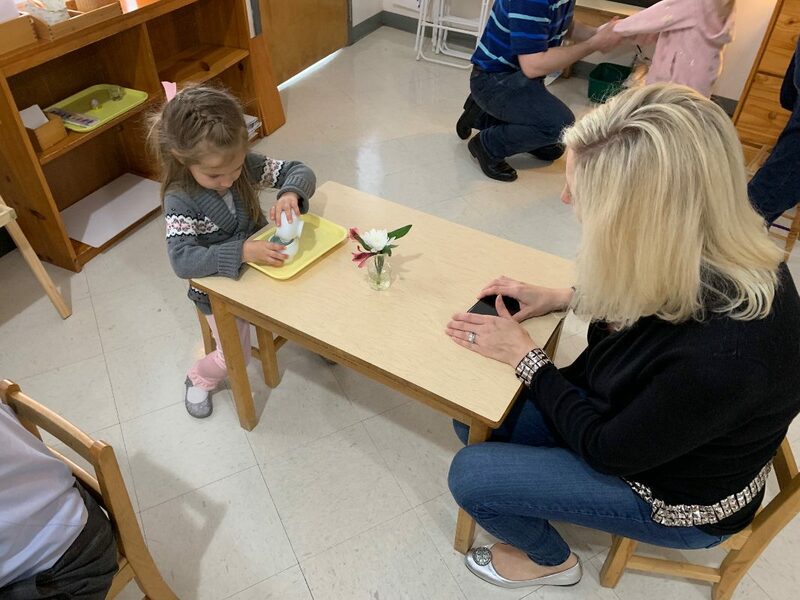 Next, the students got a fantastic opportunity to share the classroom with their families at our Parent-Child Night! 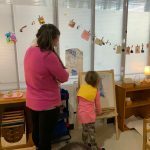 The night began with a tour around our first Art Show at Fraser Woods, where all the artwork from the year was brilliantly displayed by Mrs. Reid. 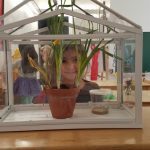 It was beautiful to see the hard work and dedication the students have put into their pieces. 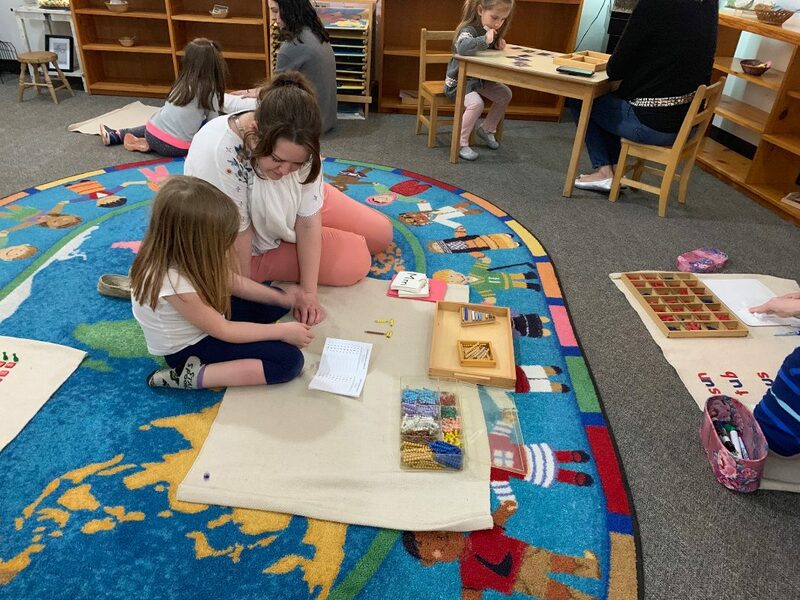 The younger students loved to see all the work that Lower Elementary, Upper Elementary, and Middle School worked on throughout the year! 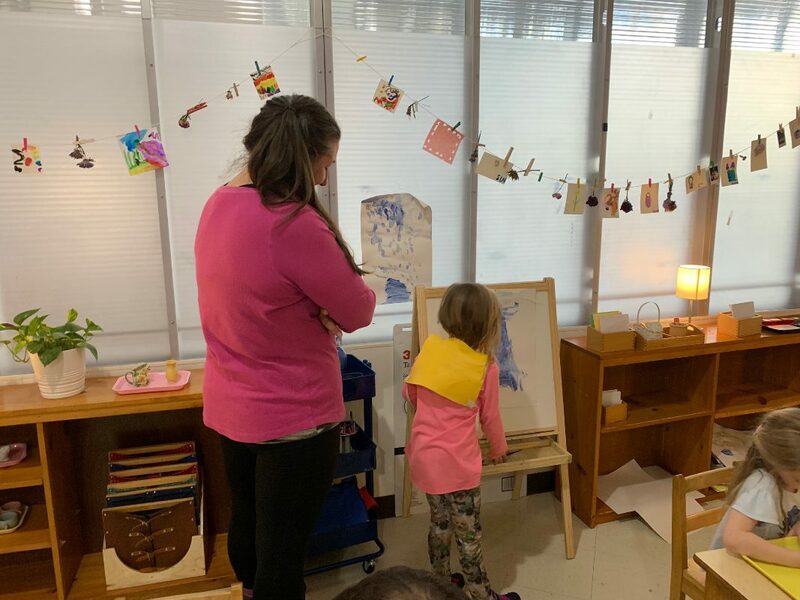 Afterwards the children got to bring their loved ones into our class to show them some of their favorite works. 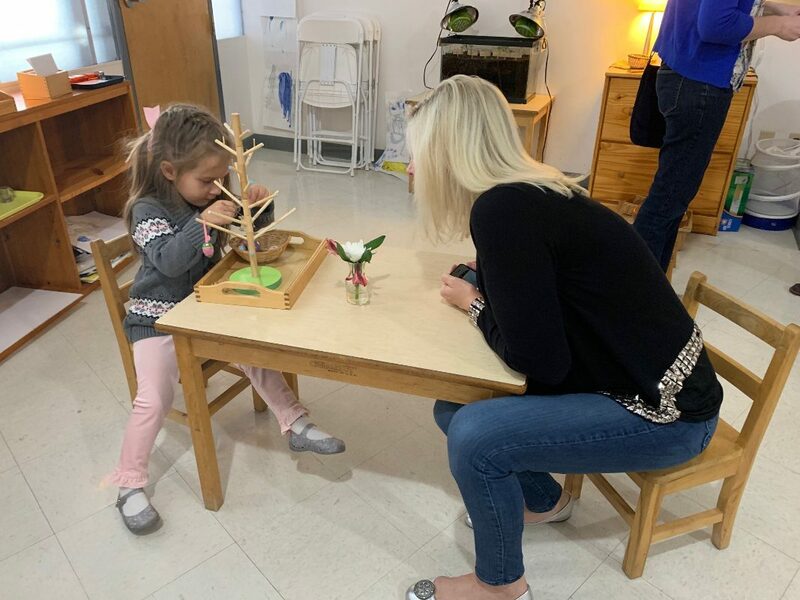 It was such a rewarding experience to watch as the children proudly showed the room to their guests and even gave their own lessons! 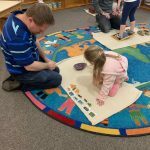 It was a memorable experience for both the parents and the students that Ms. Alli and I truly enjoyed to watch. 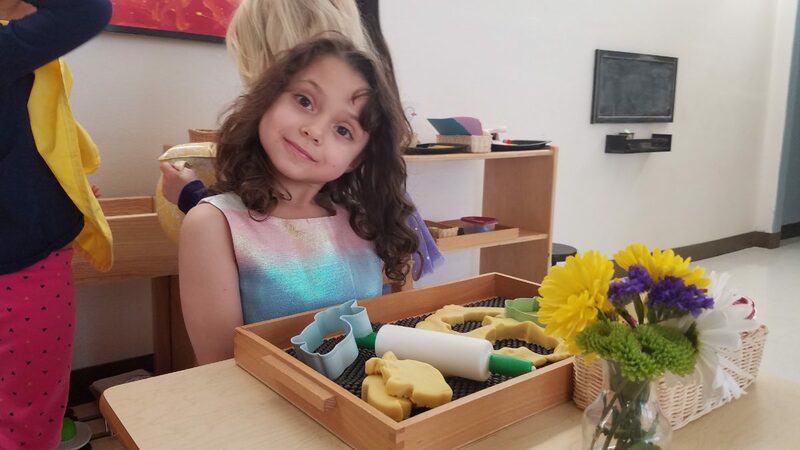 We hope that everyone who celebrates has a wonderful holiday weekend spent with family, friends, love, and laughter. 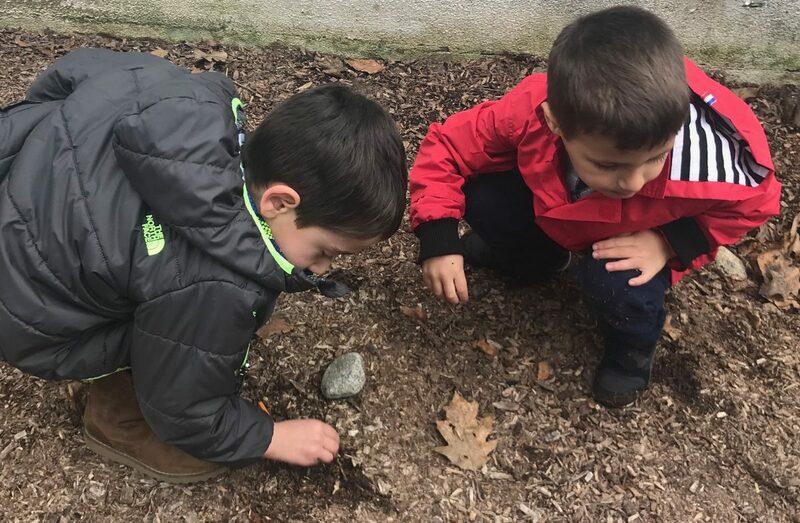 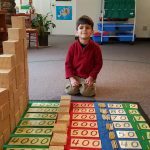 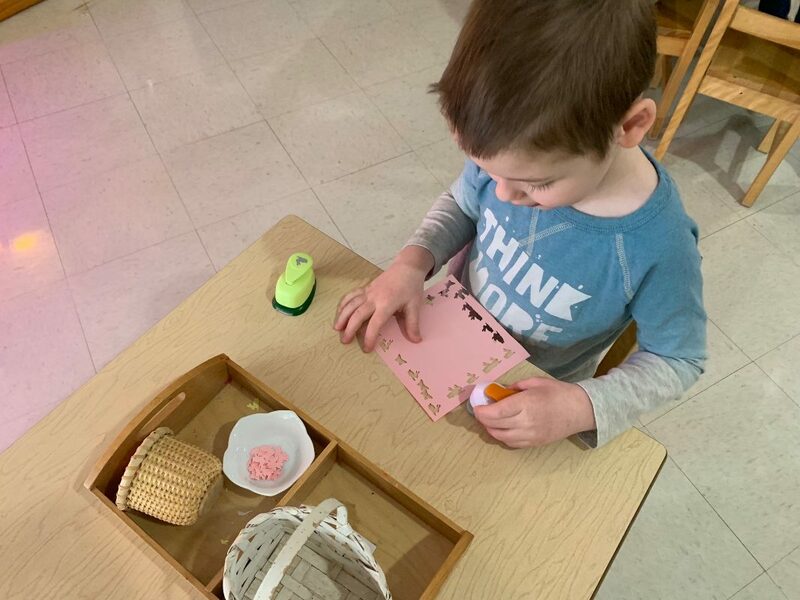 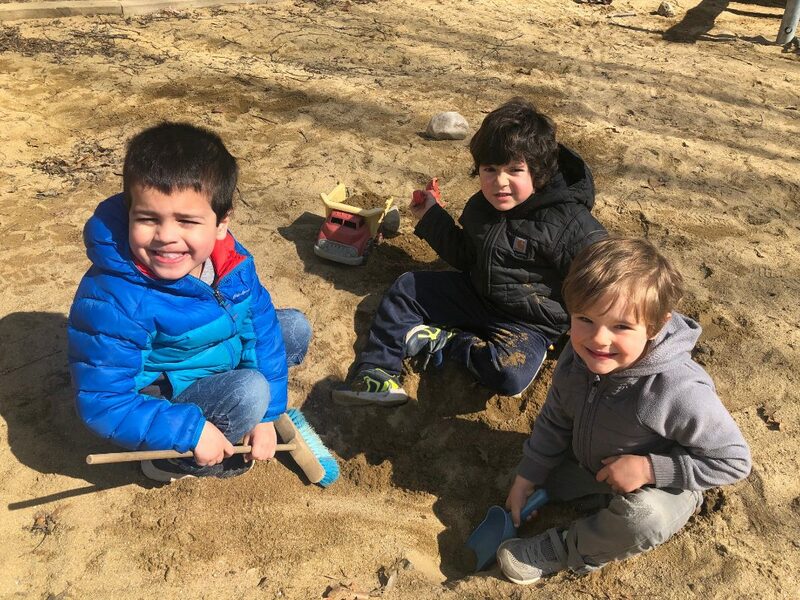 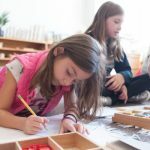 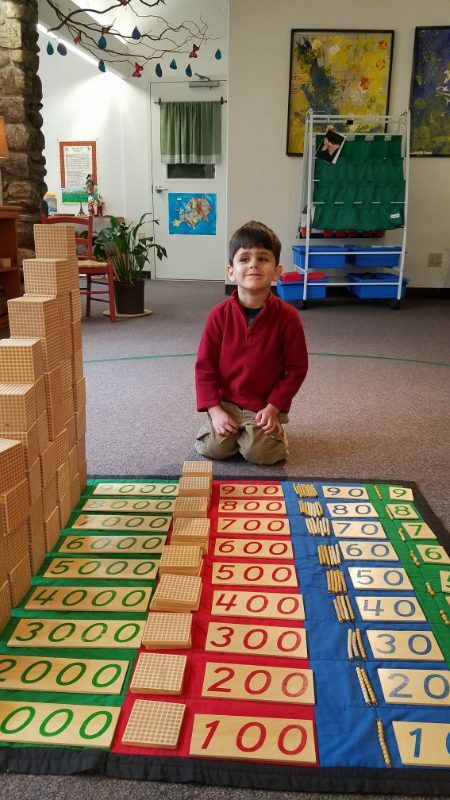 Maria Montessori believed in giving children experiences in nature. 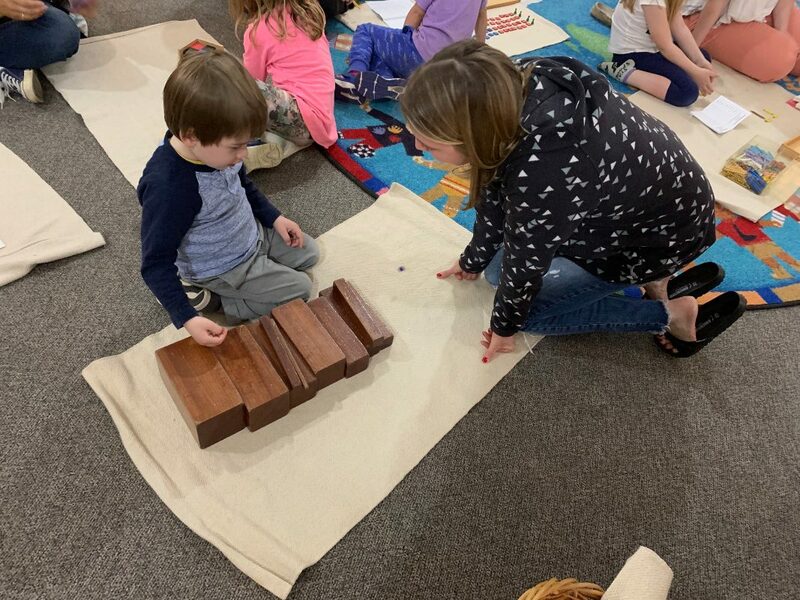 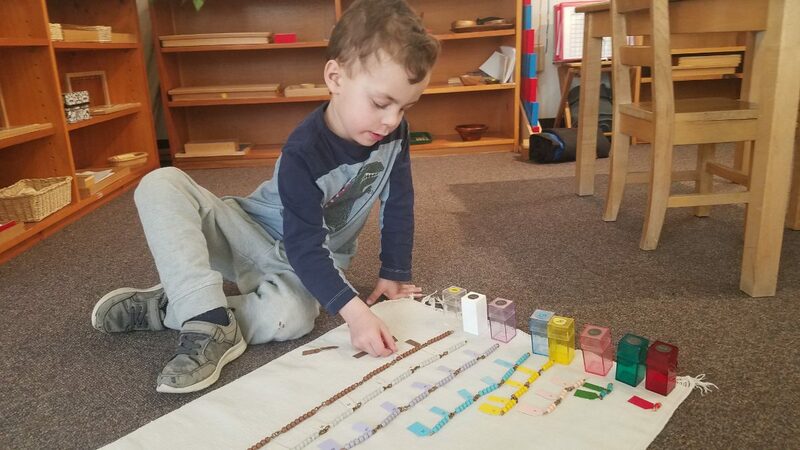 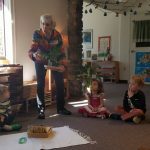 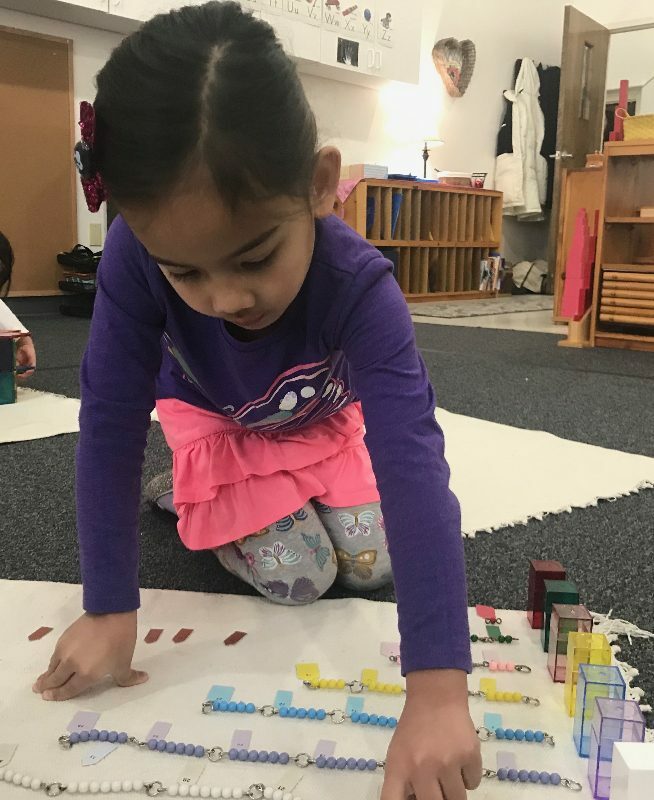 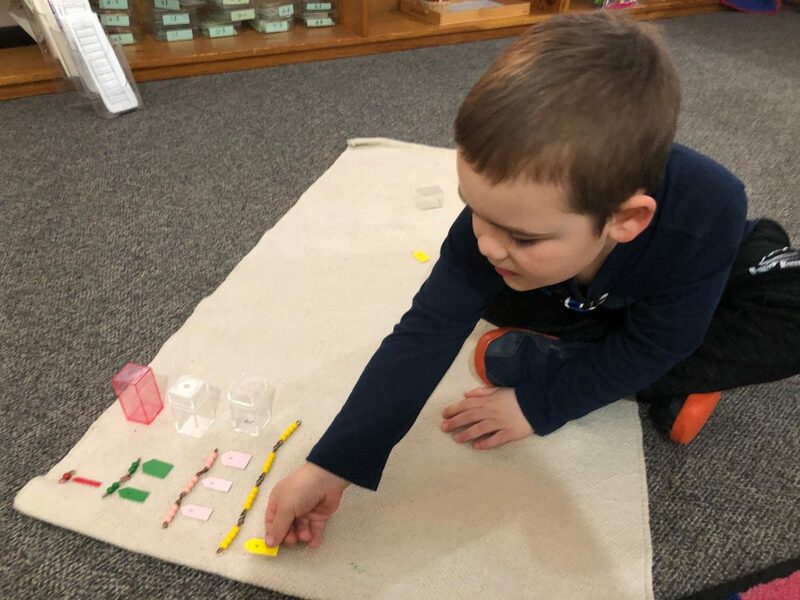 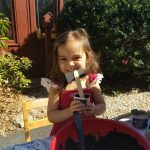 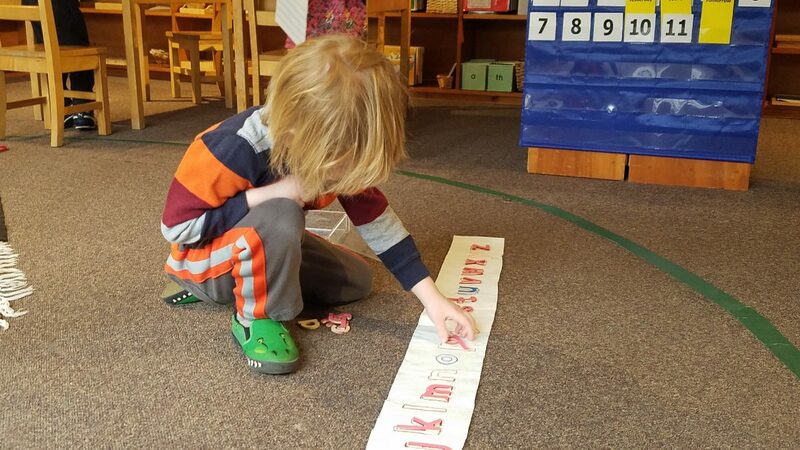 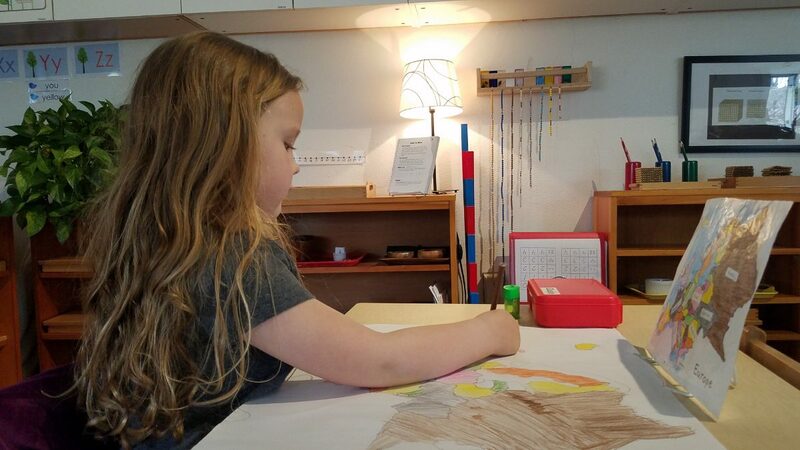 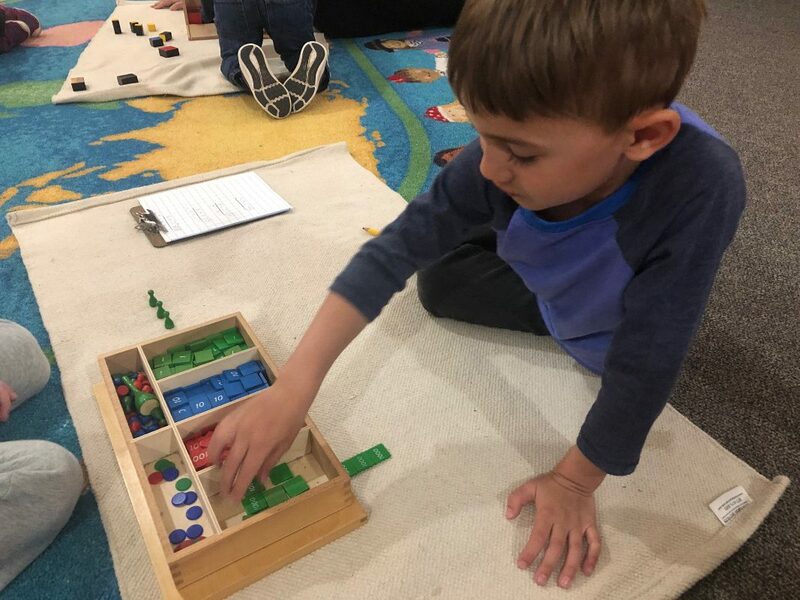 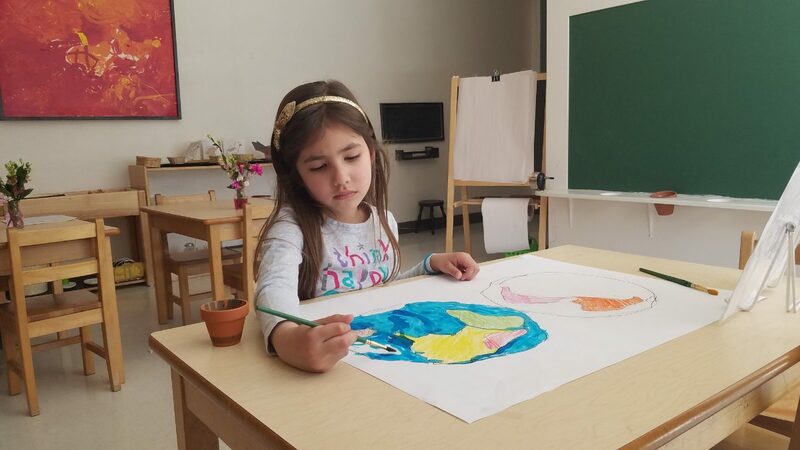 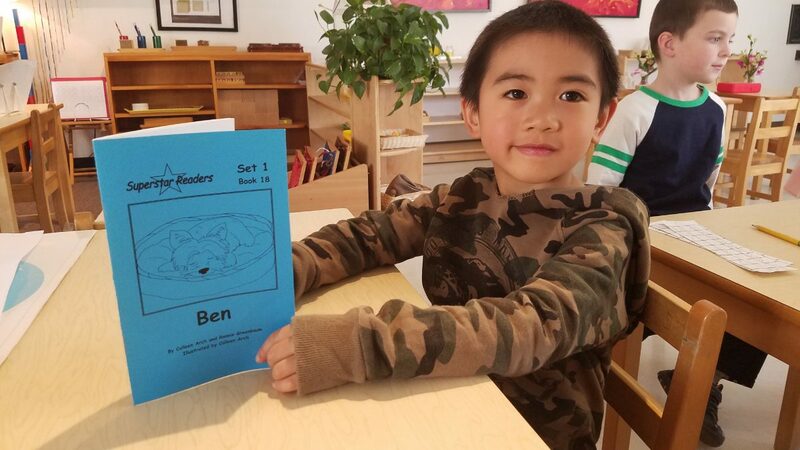 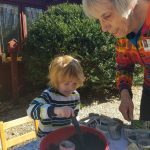 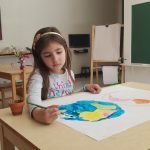 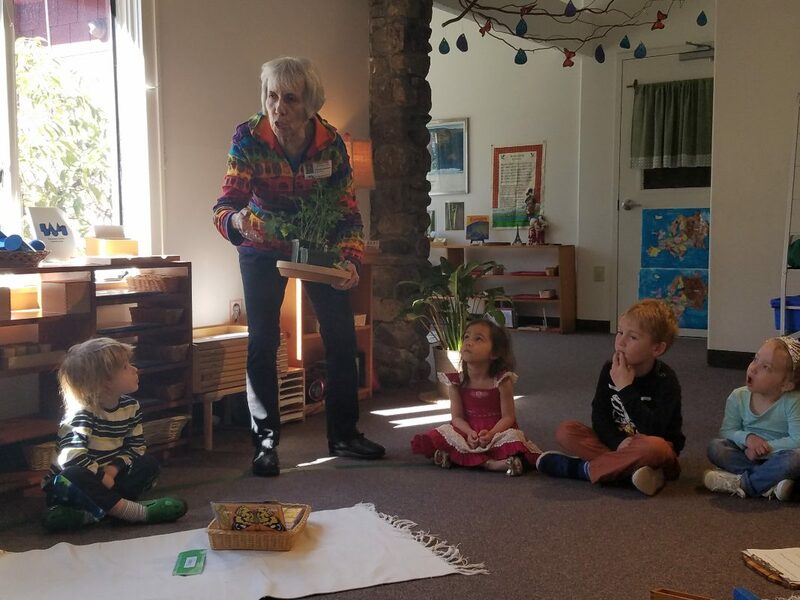 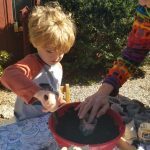 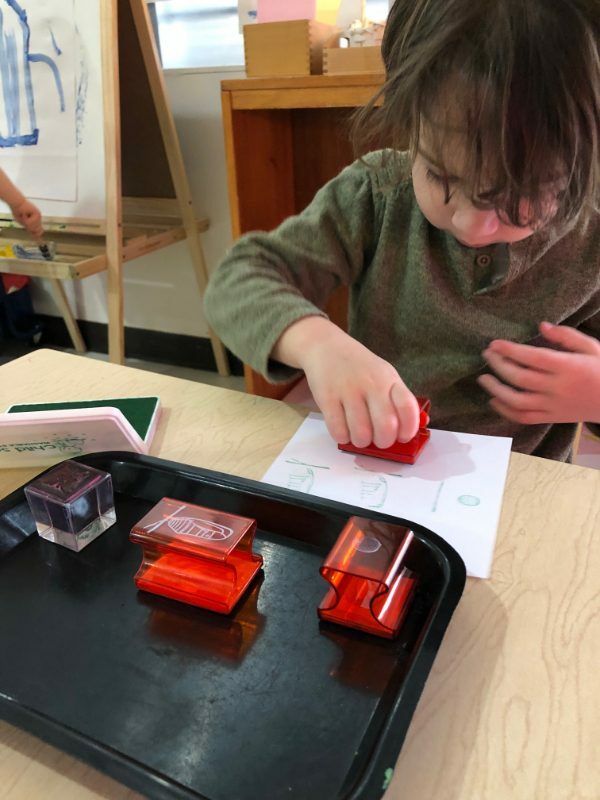 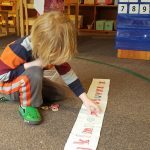 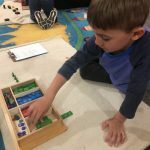 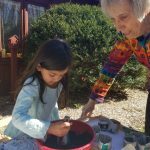 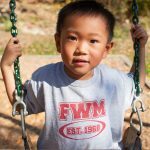 In Montessori education, Earth Day principles are a natural part of everyday learning. 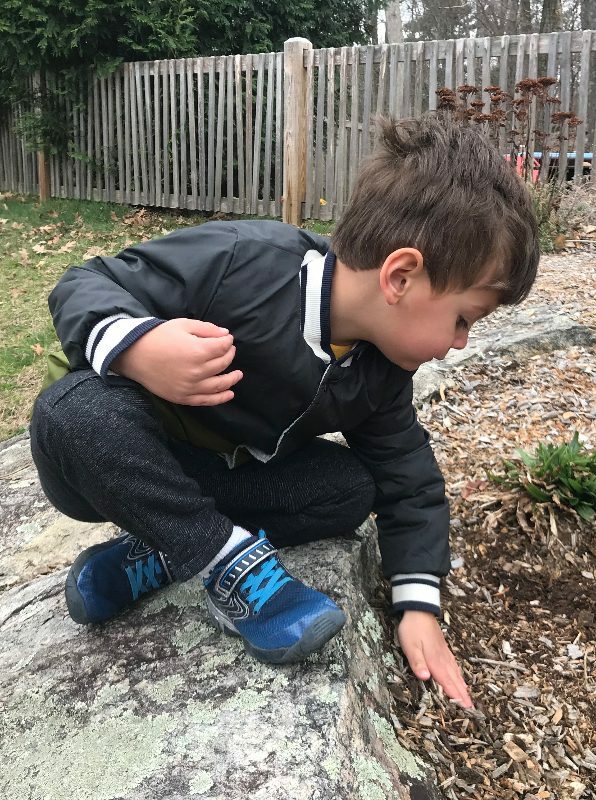 Children are encouraged to think about the Earth, and how they can become protectors of this habitat we share with all the creatures around us. 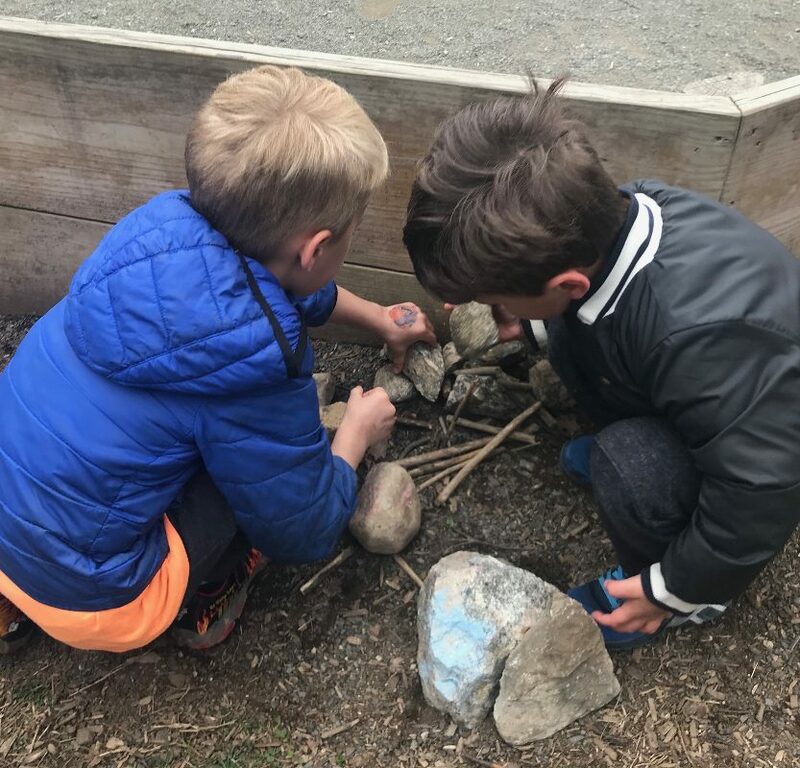 This week we celebrated Earth Day in our classroom as an extra way to show respect for the Earth and to build community. 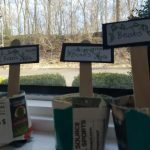 The class discussed what it means to renew, reuse, and recycle. 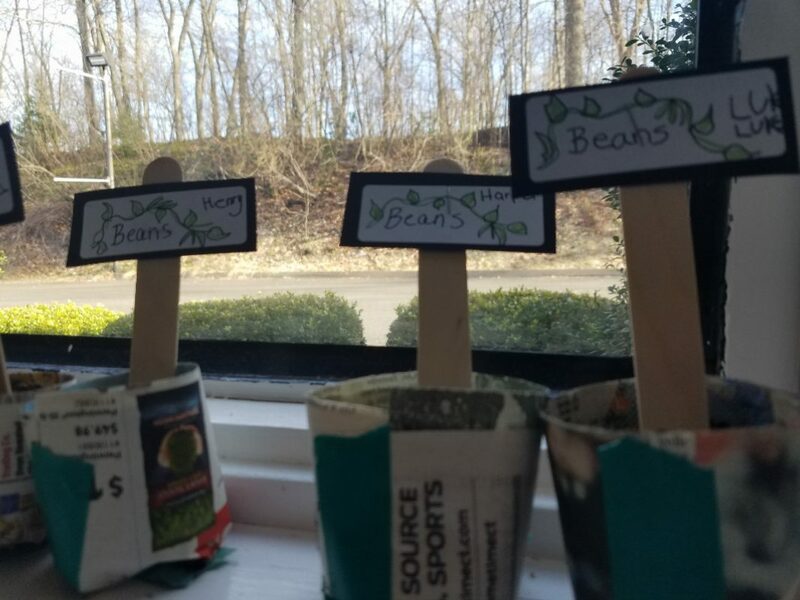 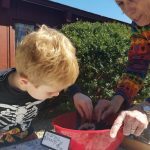 The children planted container bean seeds in a pot made from recycled newspaper. 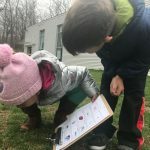 They kept a conservation checklist of things they are doing to help the environment such as turn off the water while brushing teeth and turn off lights while playing outside. 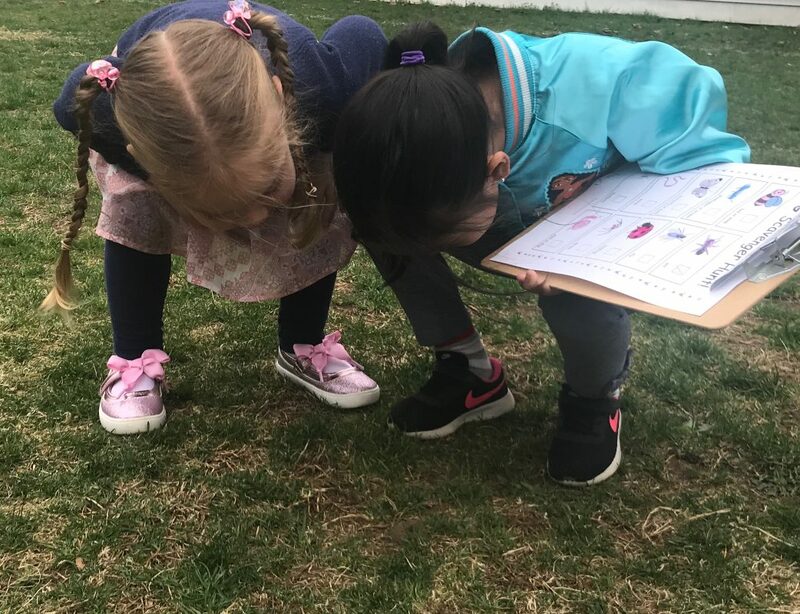 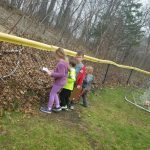 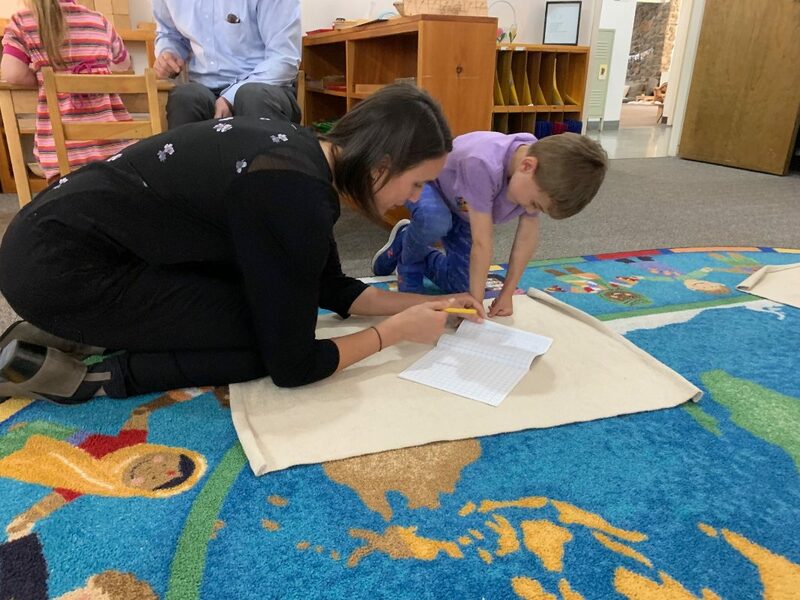 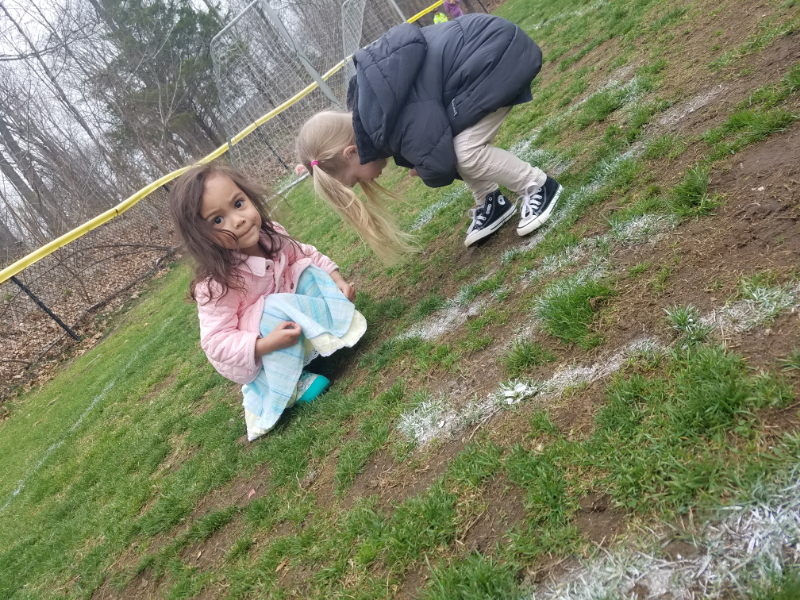 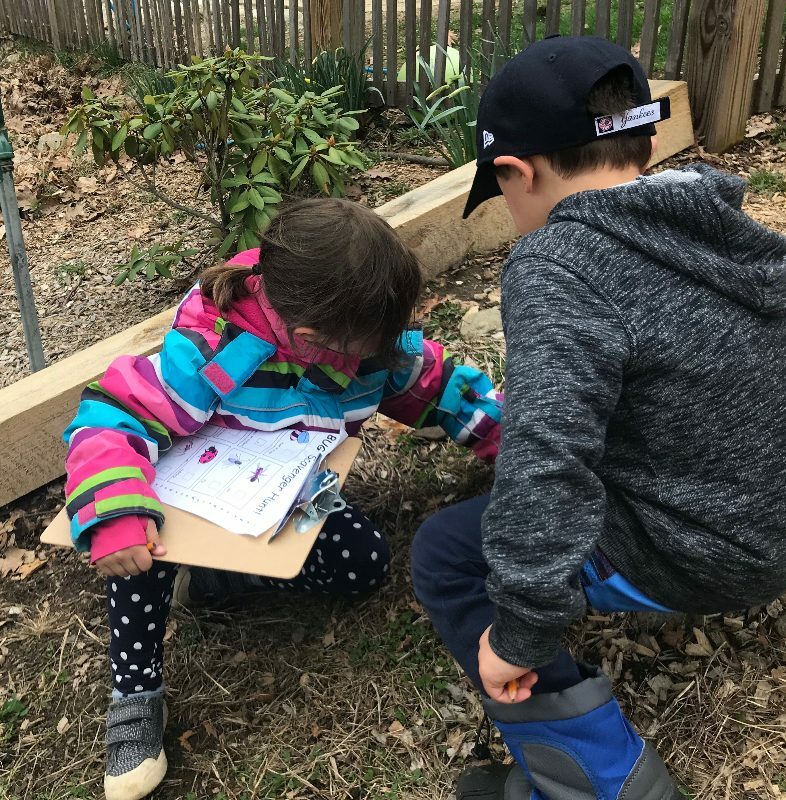 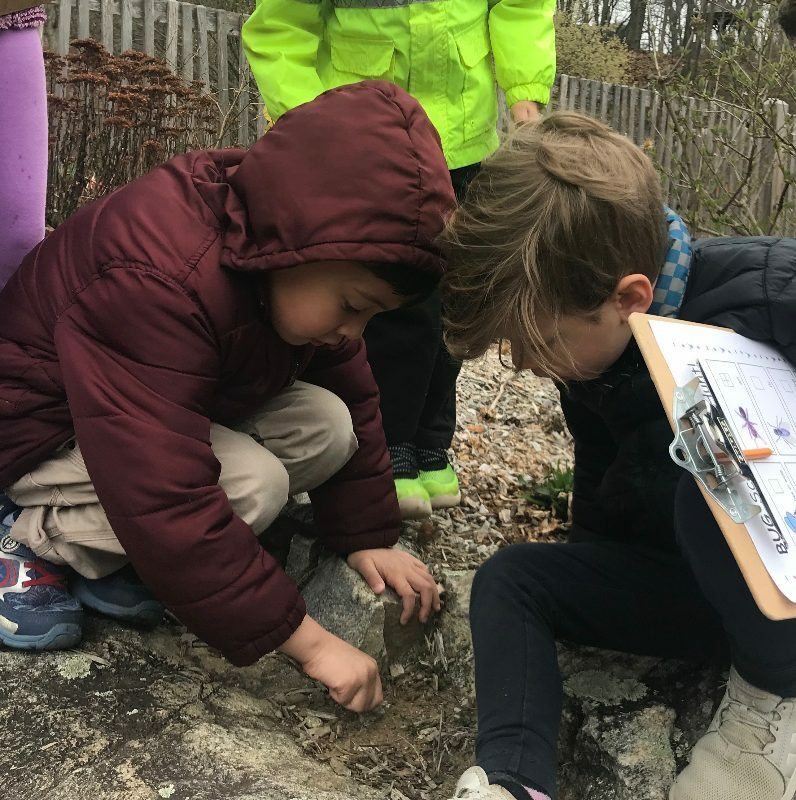 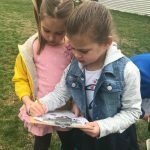 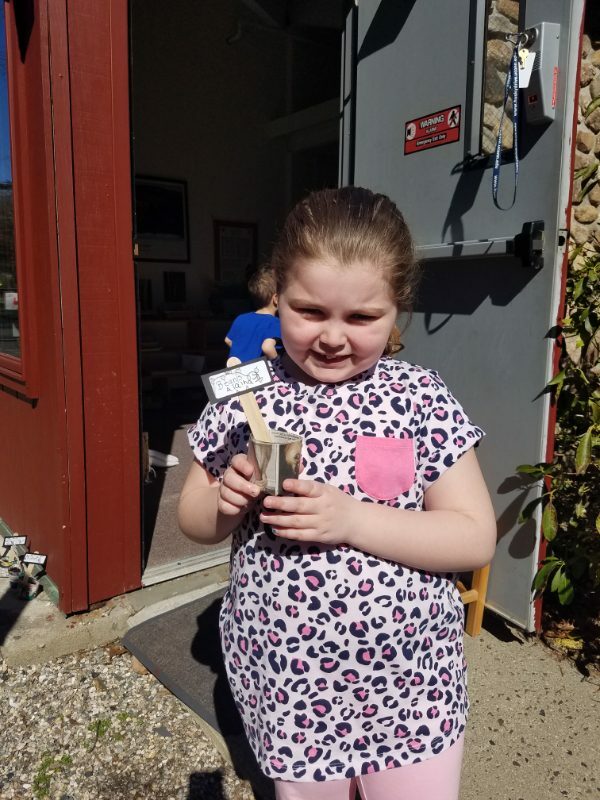 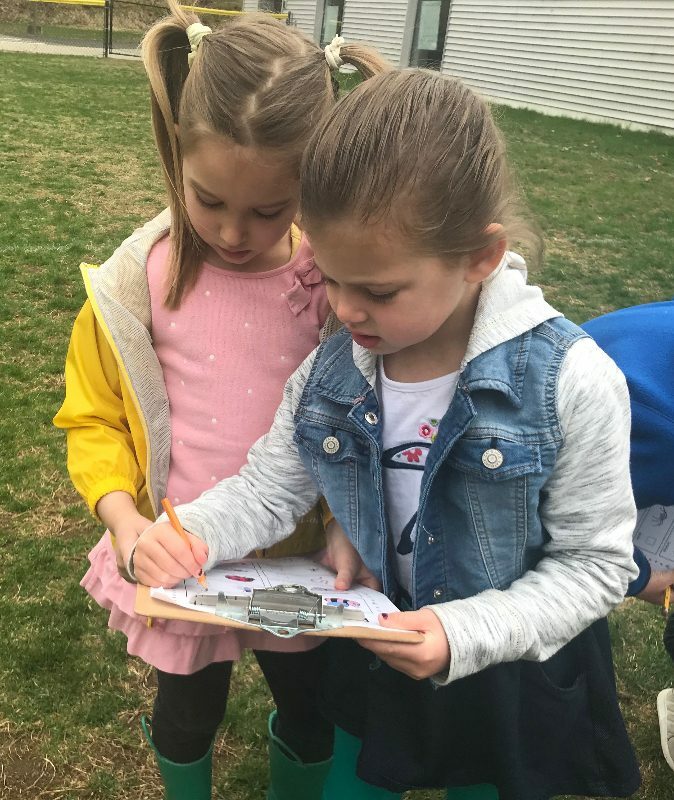 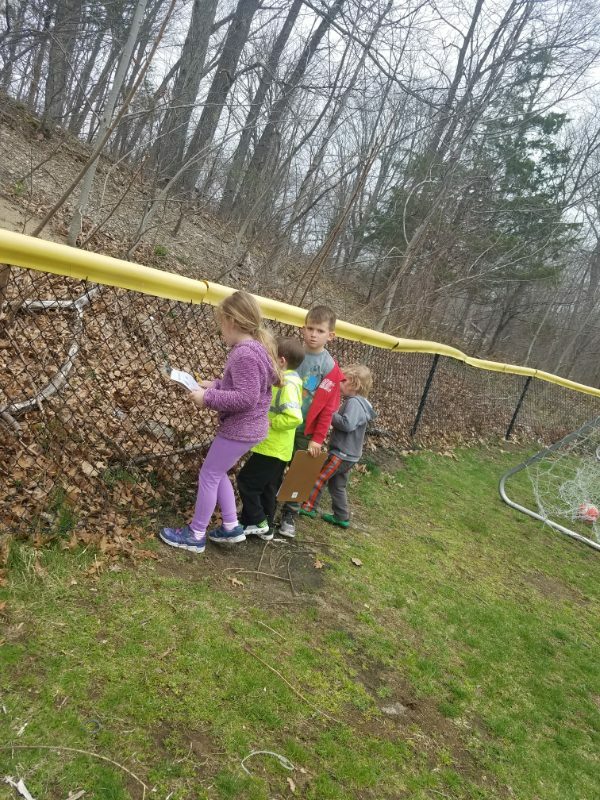 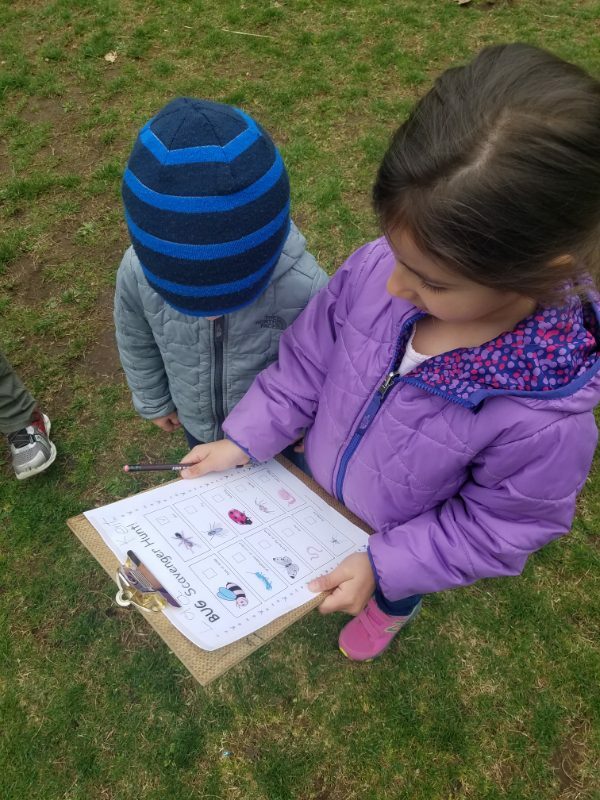 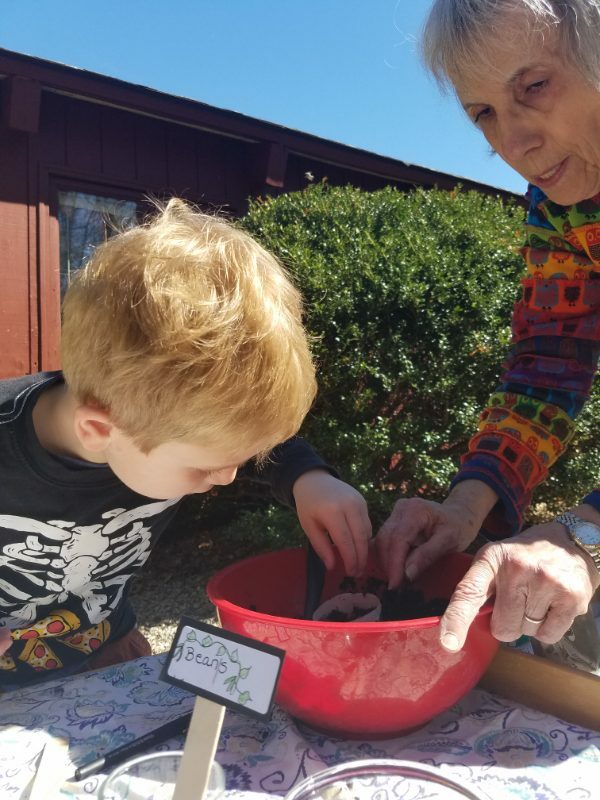 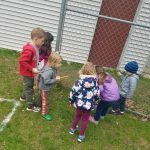 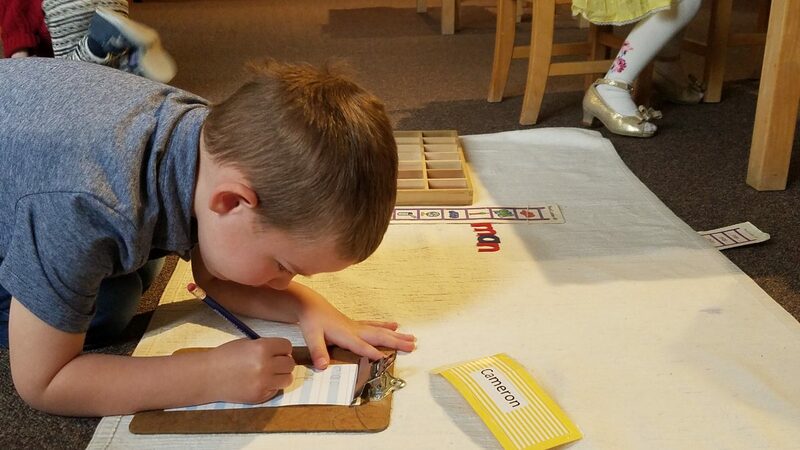 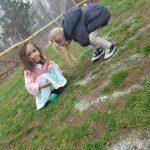 Our week concluded with our budding naturalists participating in a bug scavenger hunt, to get close and personal with insects in our environment. 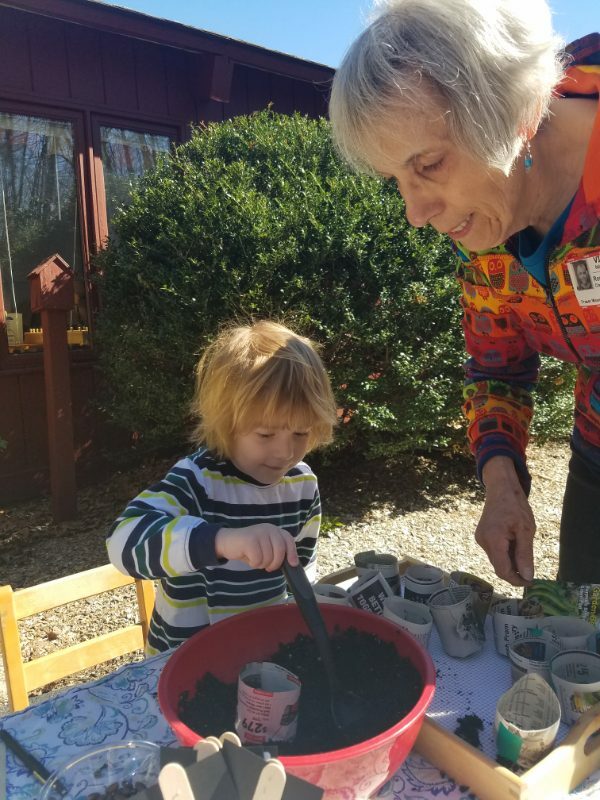 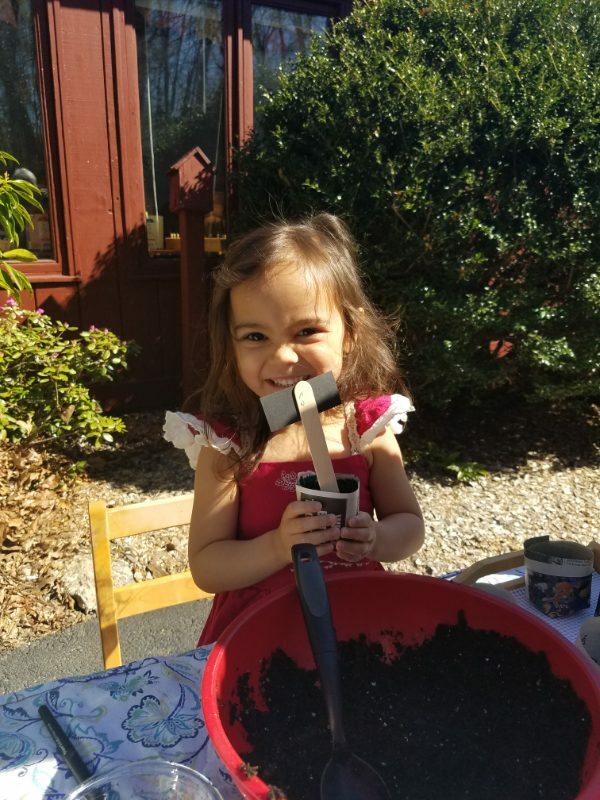 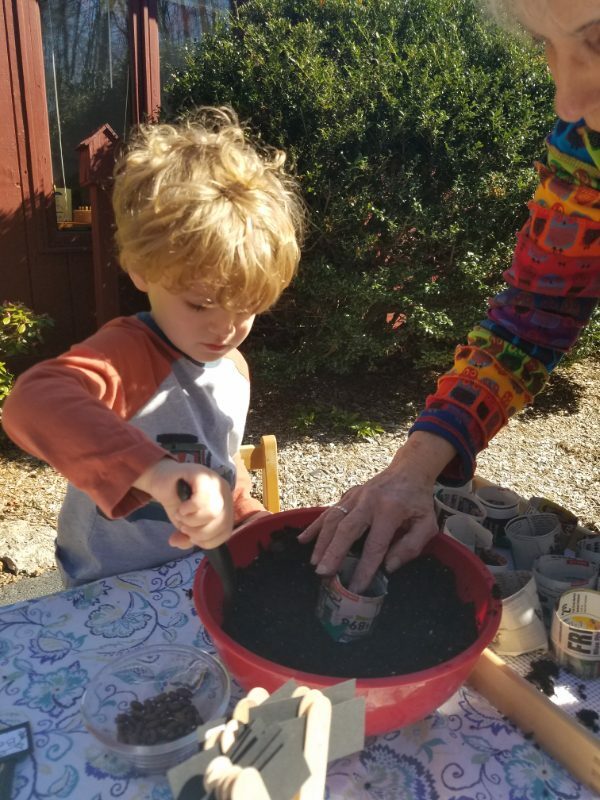 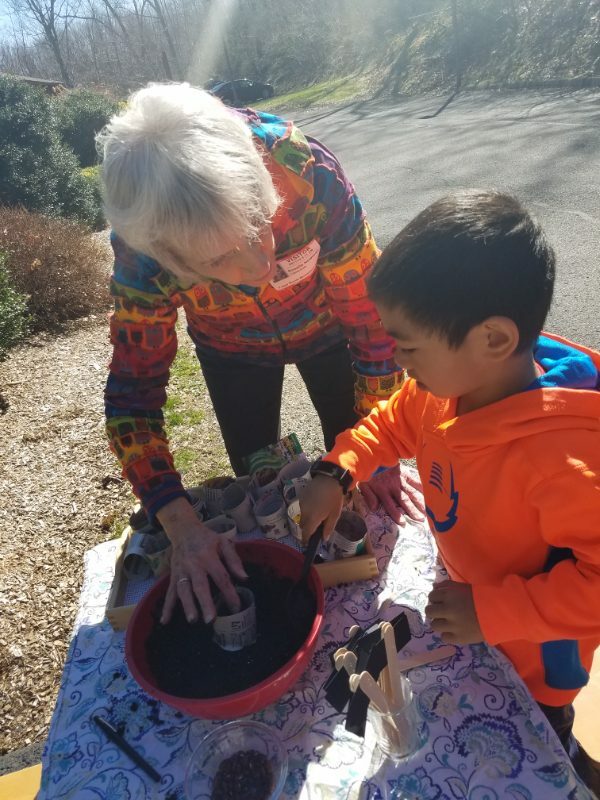 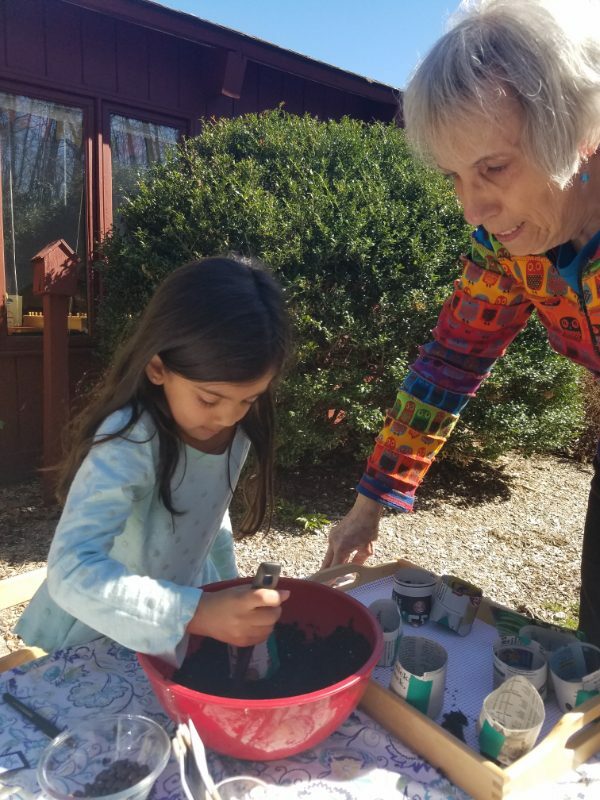 By celebrating Earth Day and encouraging children’s participation at a young age, we contribute to cultivating lifelong caretakers of this planet we call home. 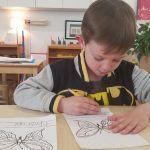 Ms. Kayser’s Class: Like a Caterpillar into a Butterfly..
My, has this year flown by. 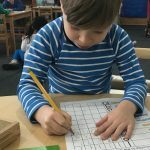 It seems like yesterday that the classroom was buzzing with eager excitement for what was to come. 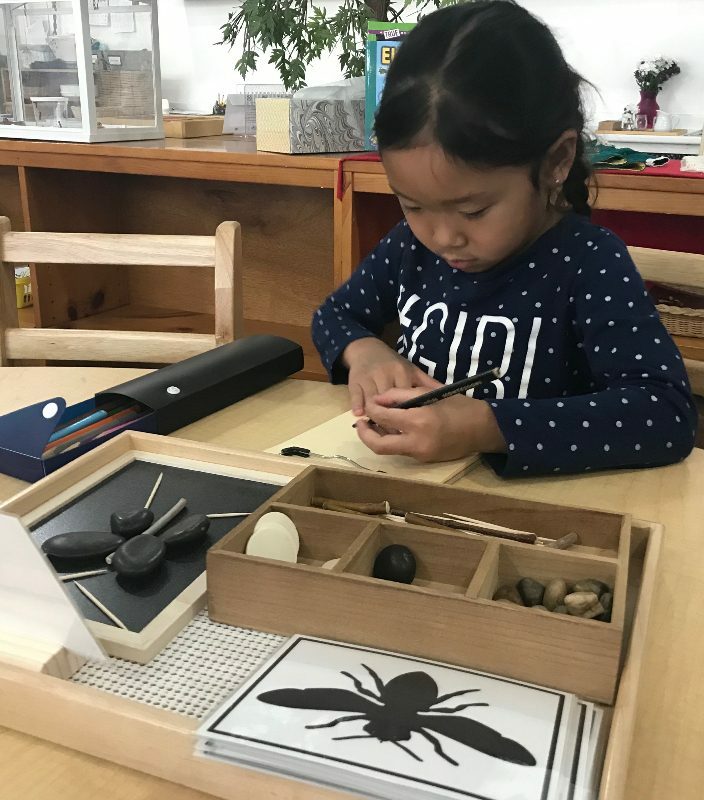 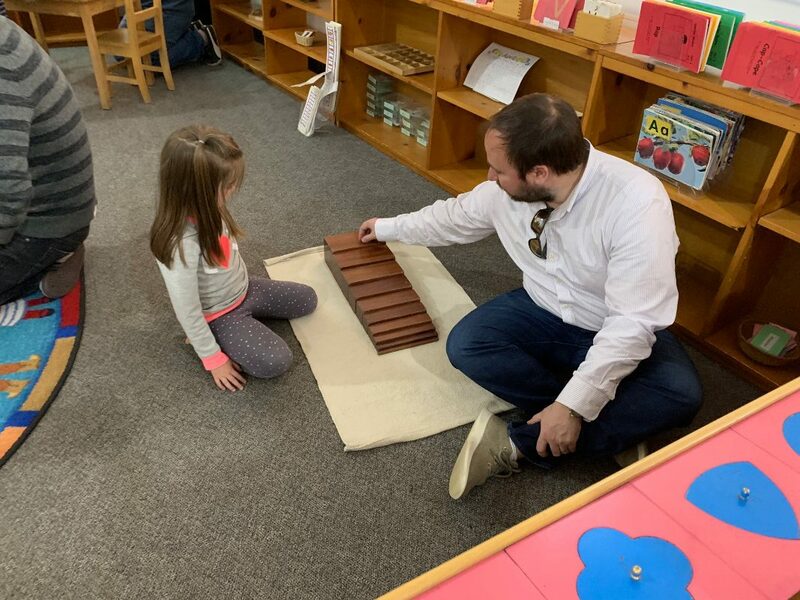 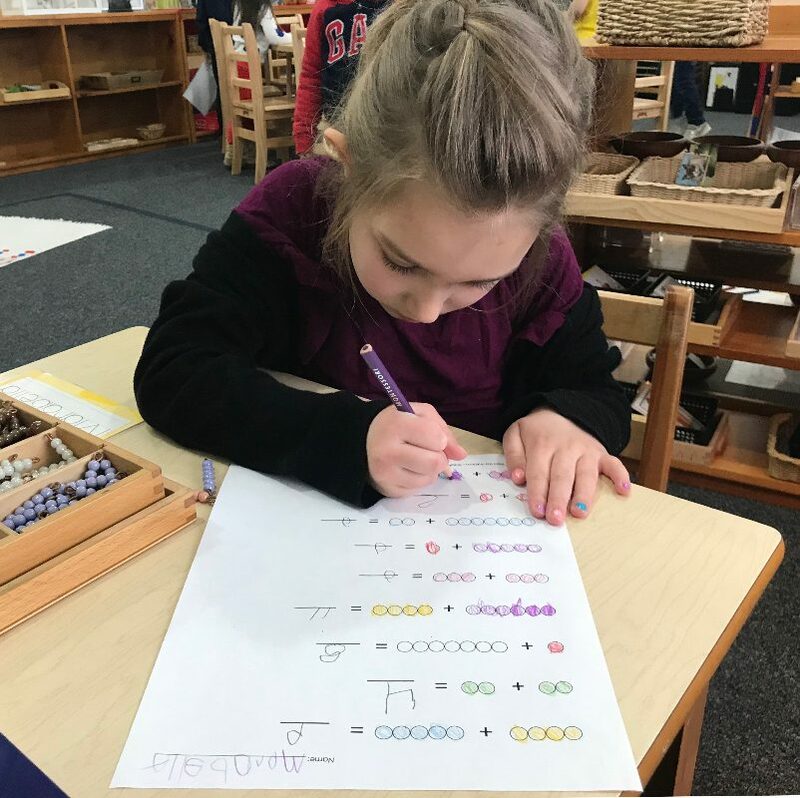 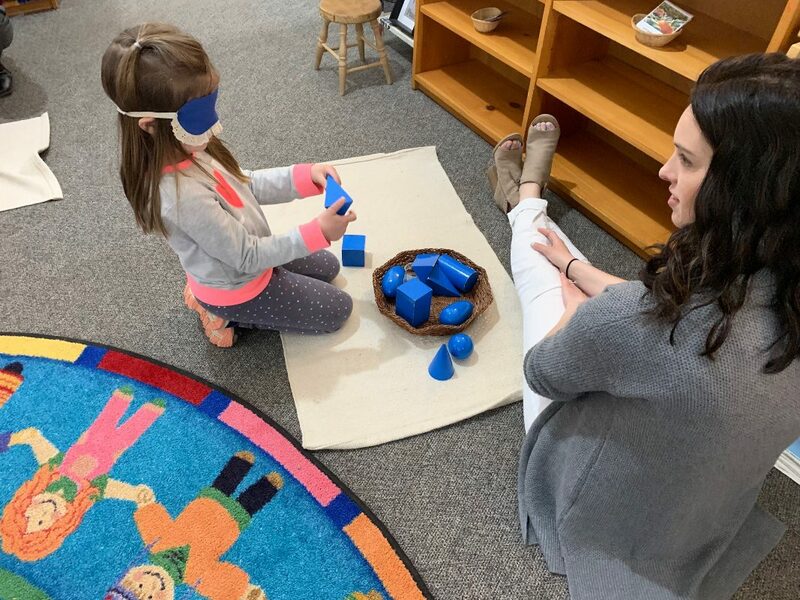 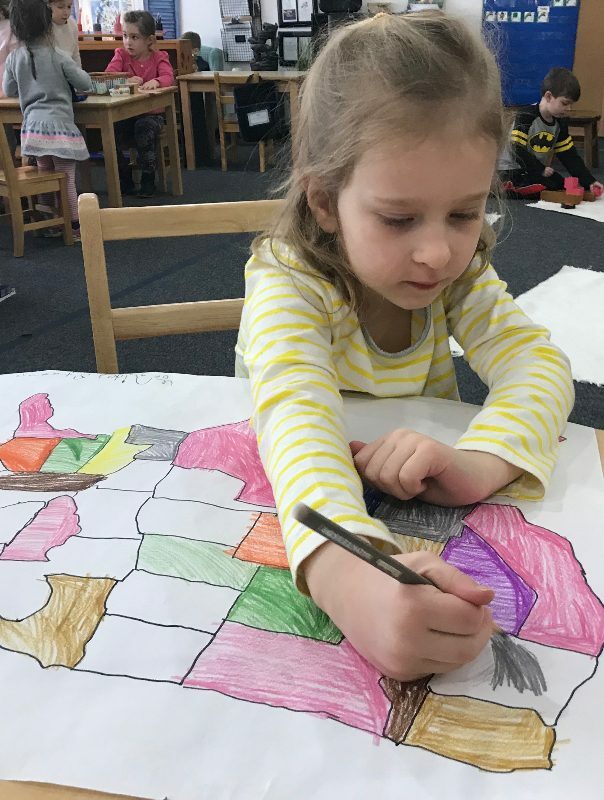 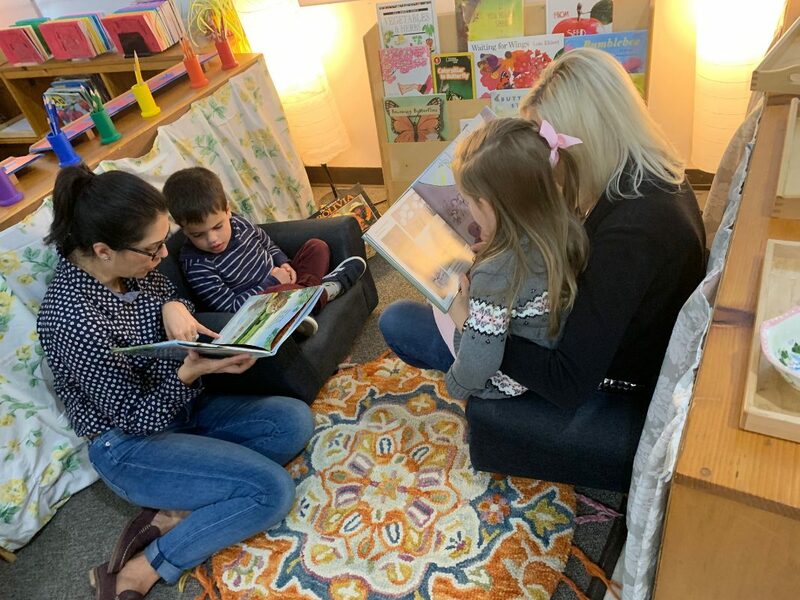 The students were all so unsure of what the year had waiting for them, but in a blink of an eye, they have grown into insightful, creative, and secure little humans. 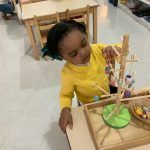 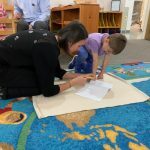 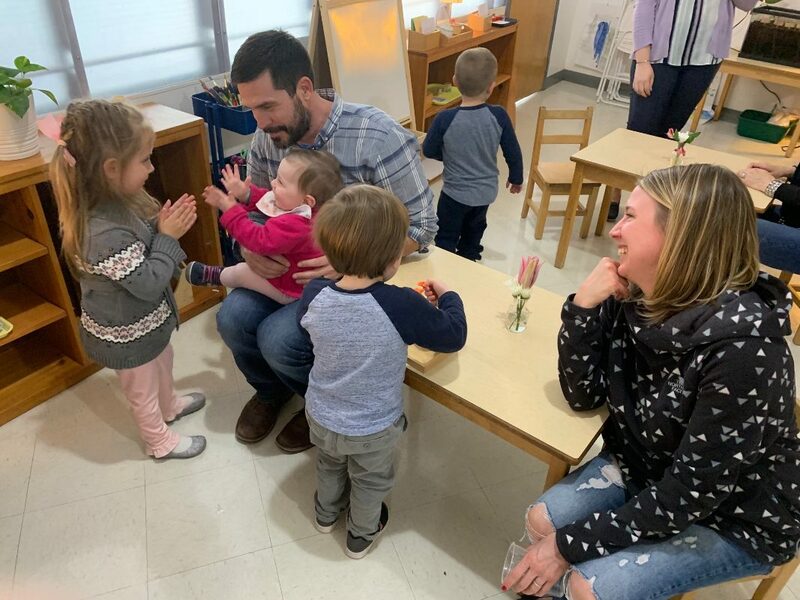 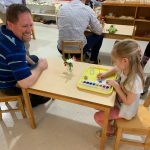 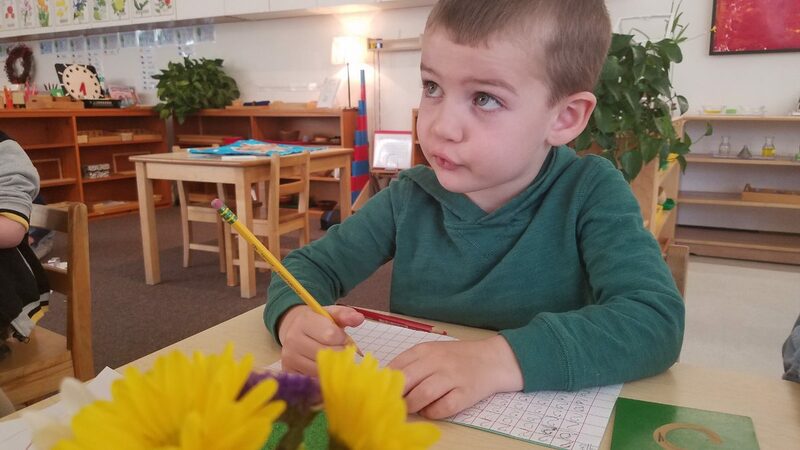 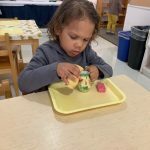 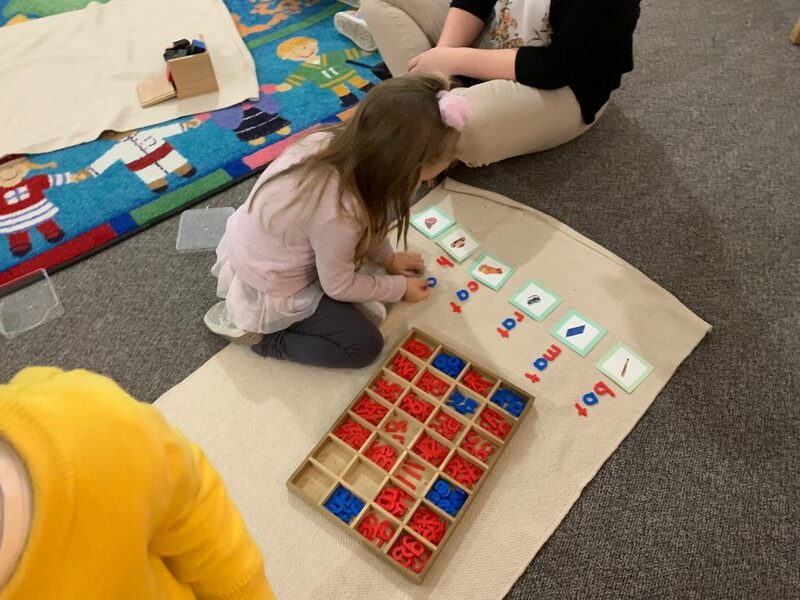 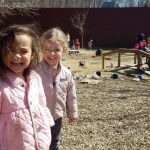 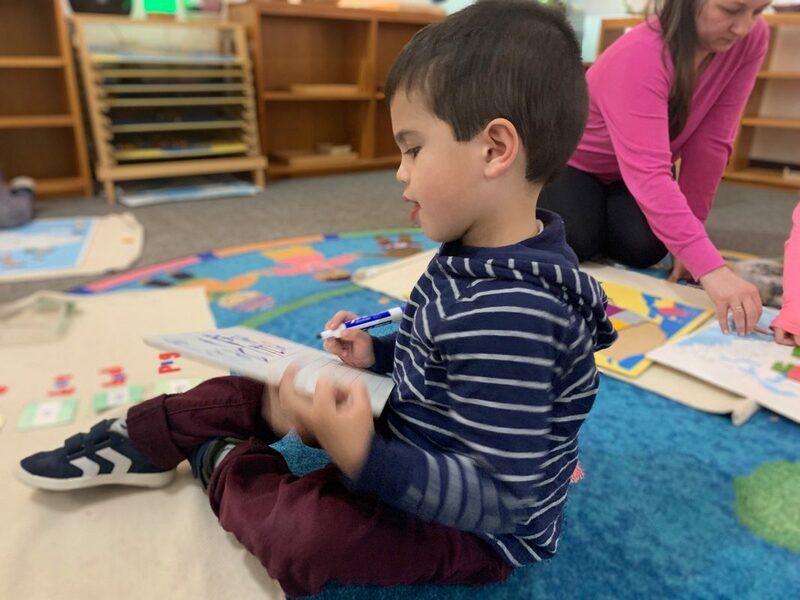 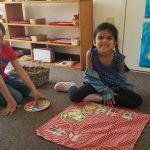 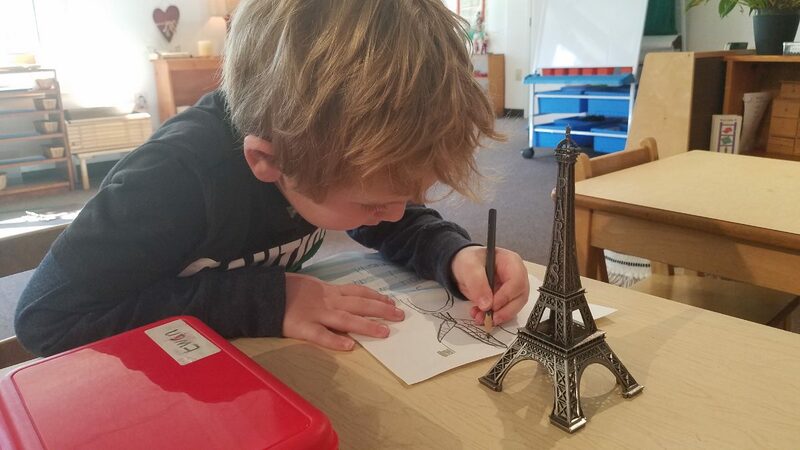 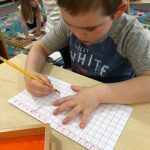 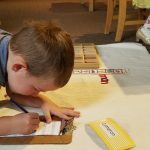 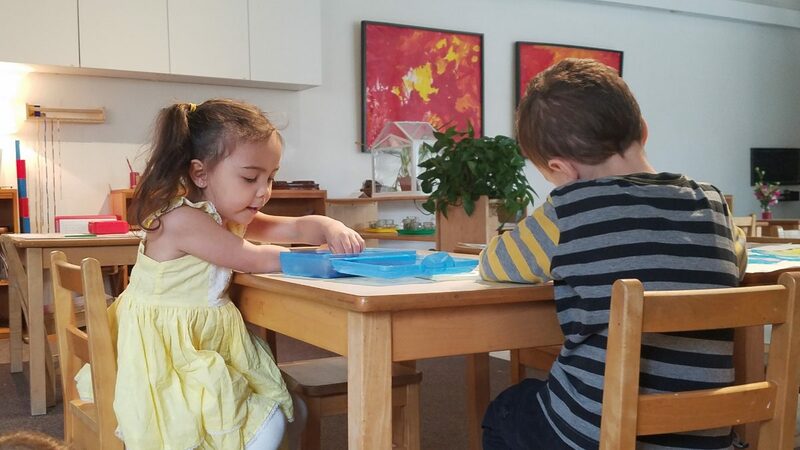 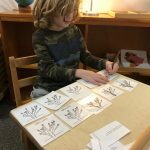 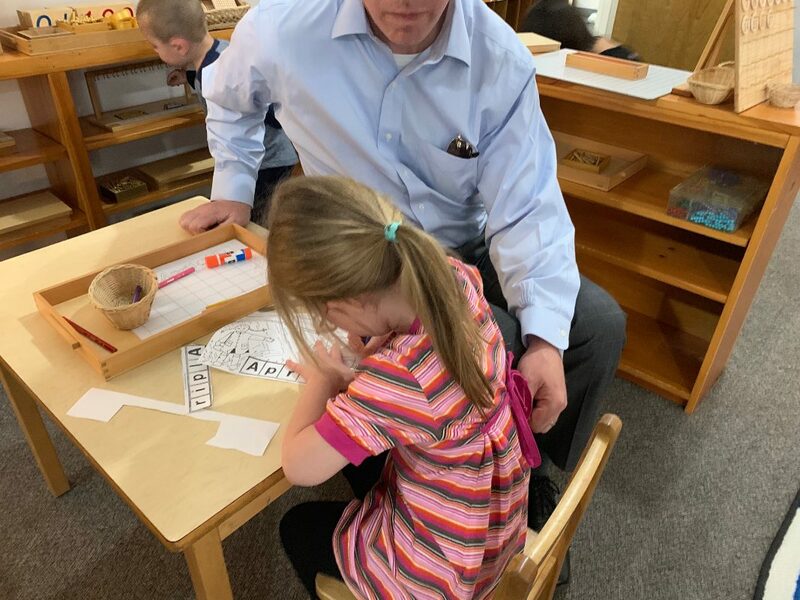 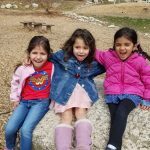 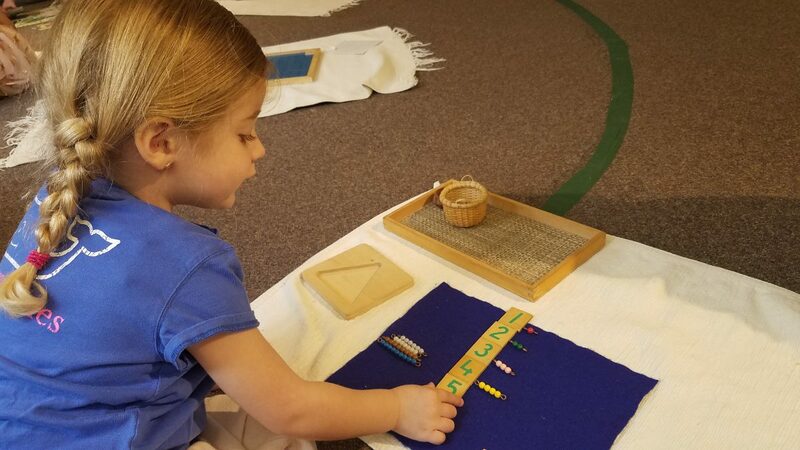 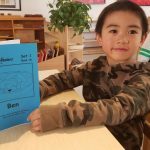 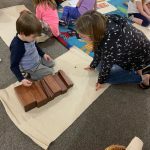 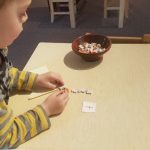 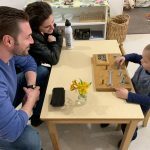 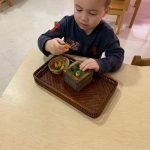 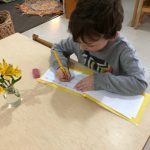 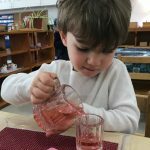 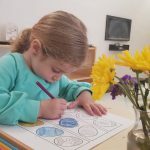 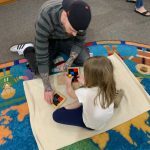 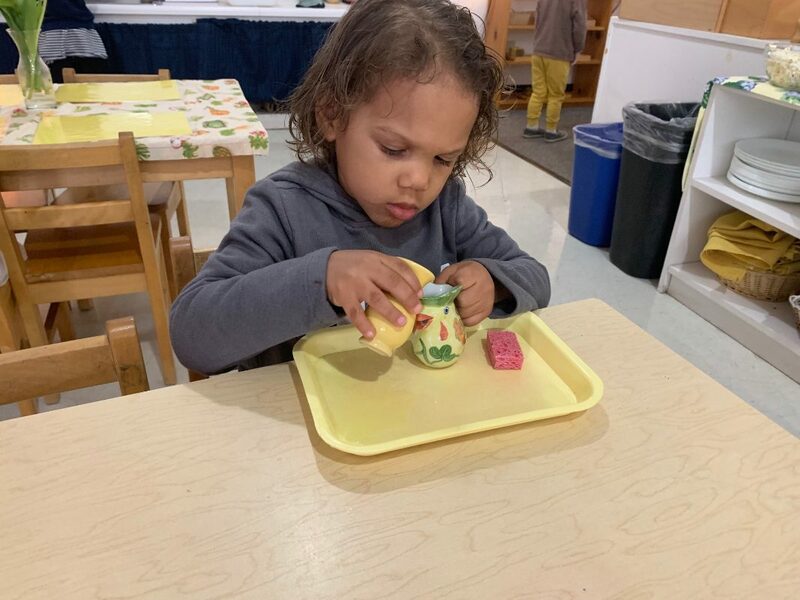 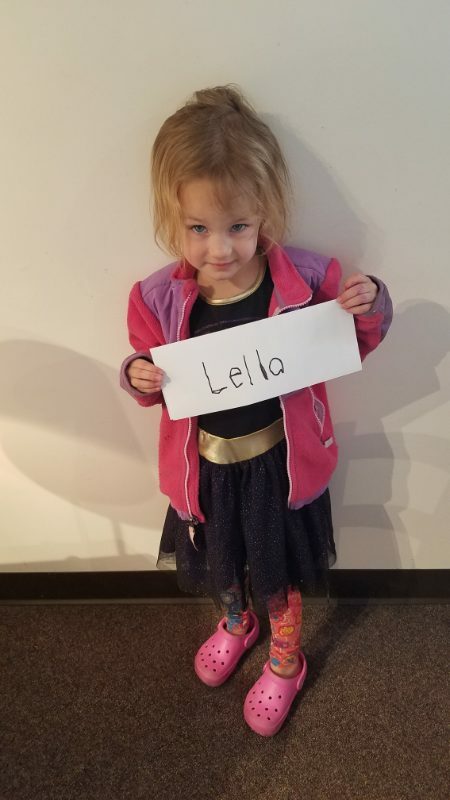 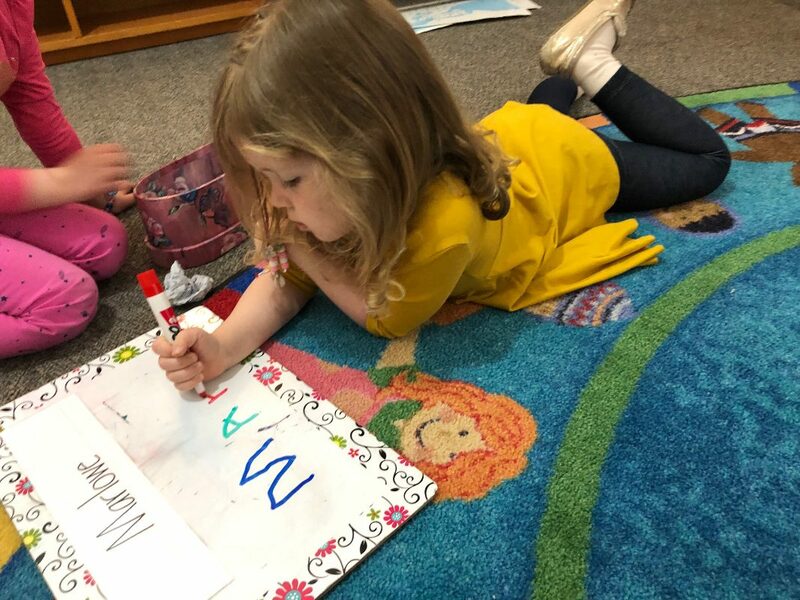 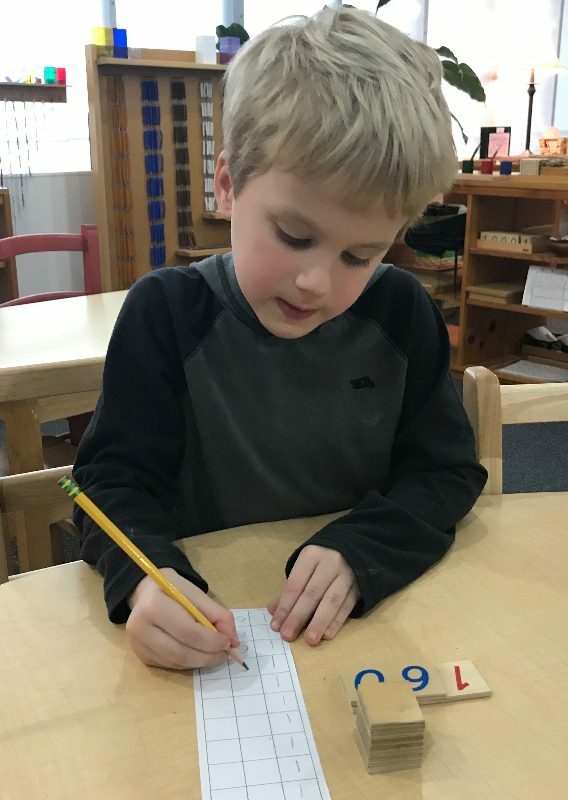 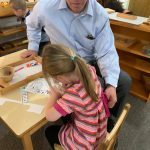 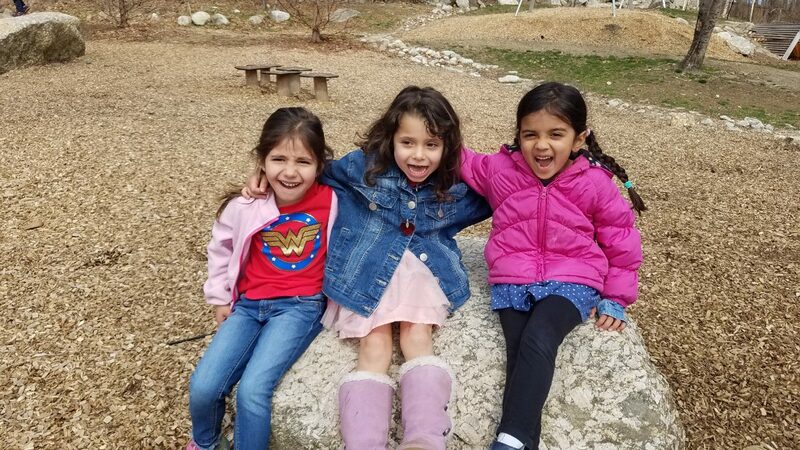 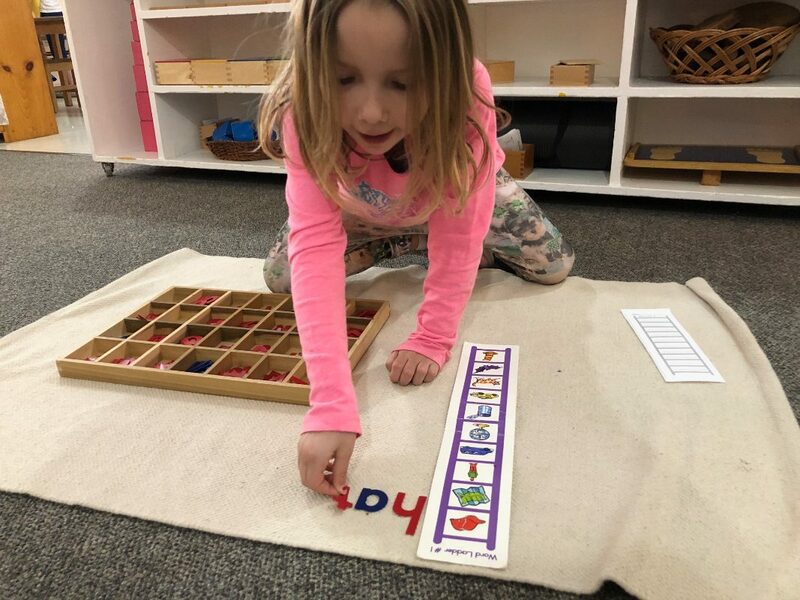 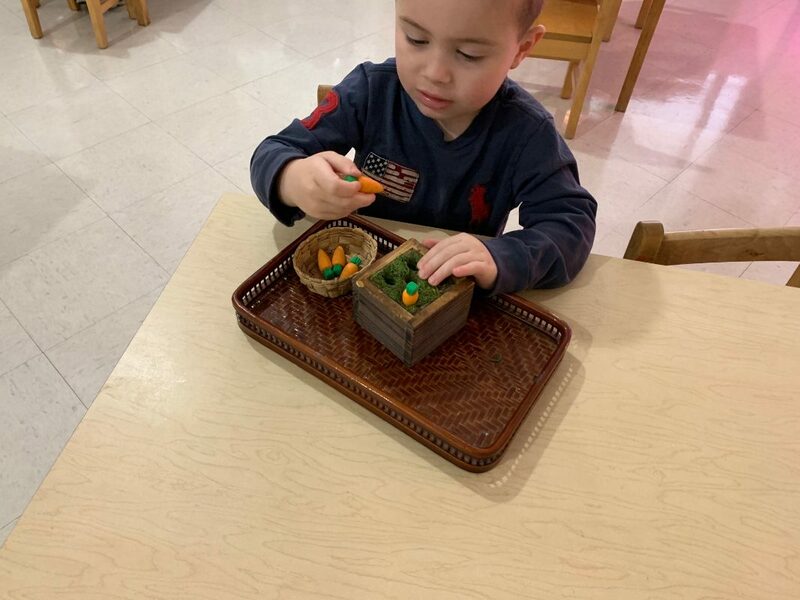 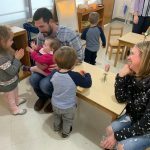 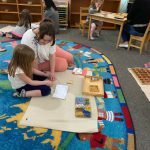 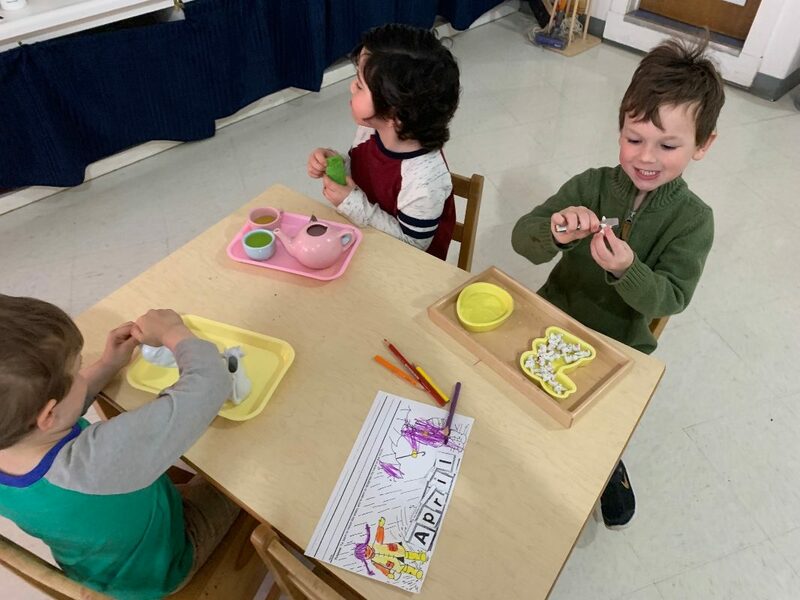 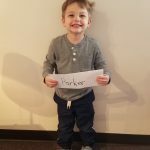 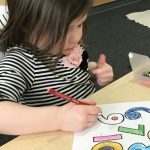 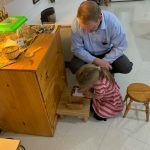 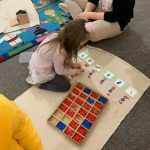 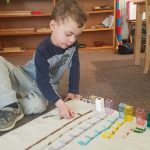 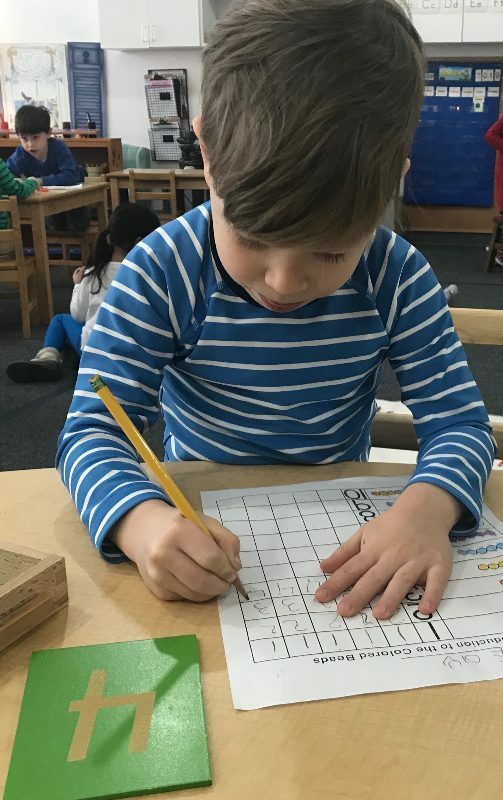 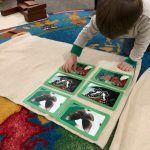 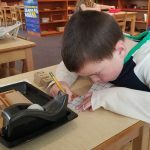 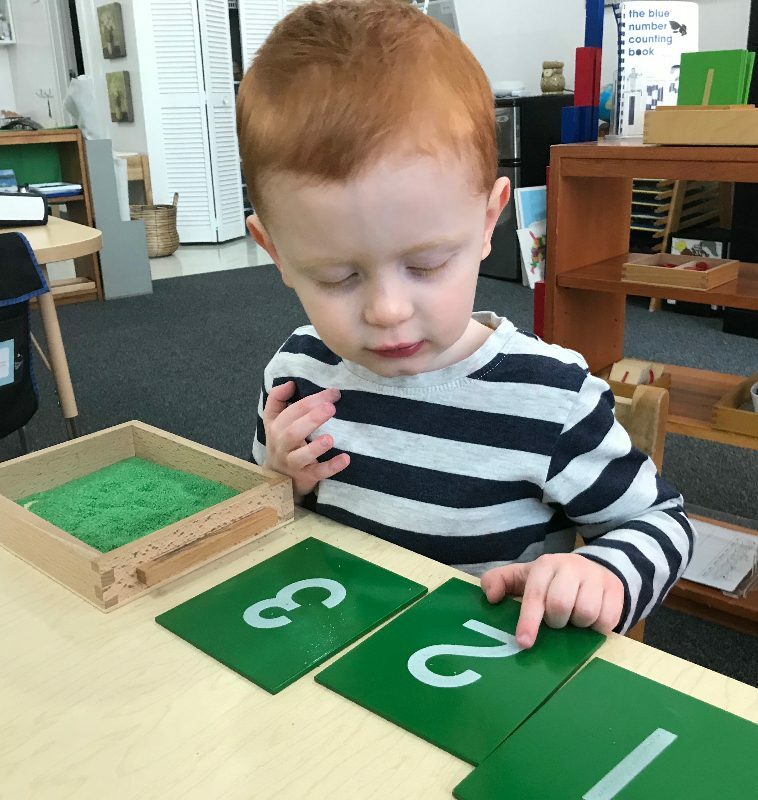 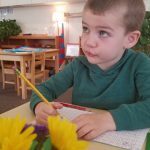 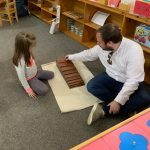 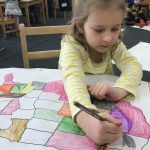 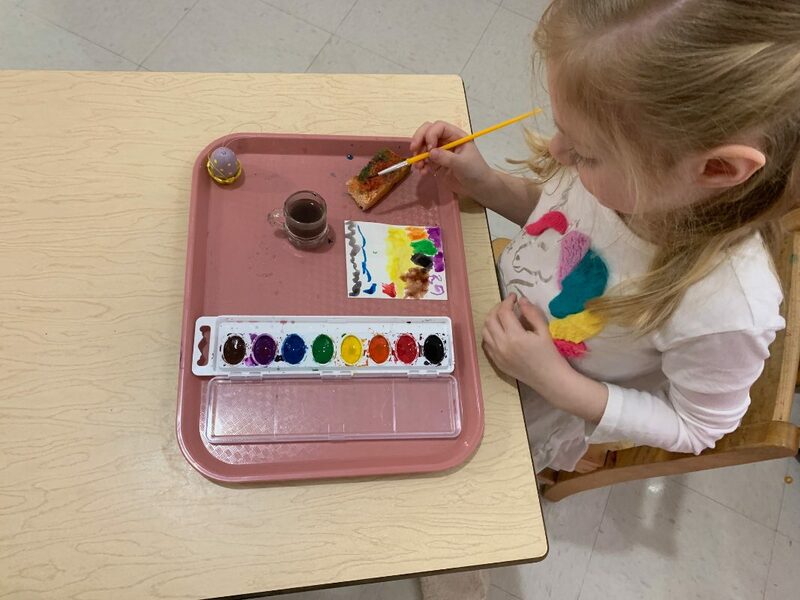 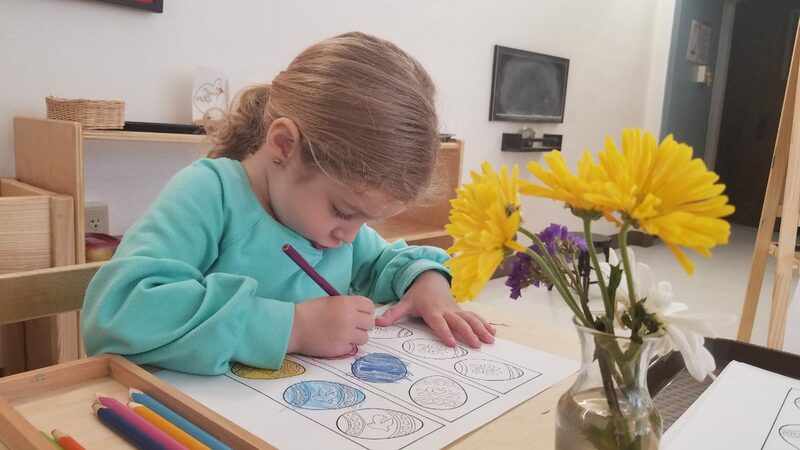 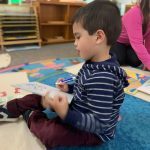 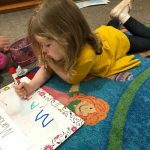 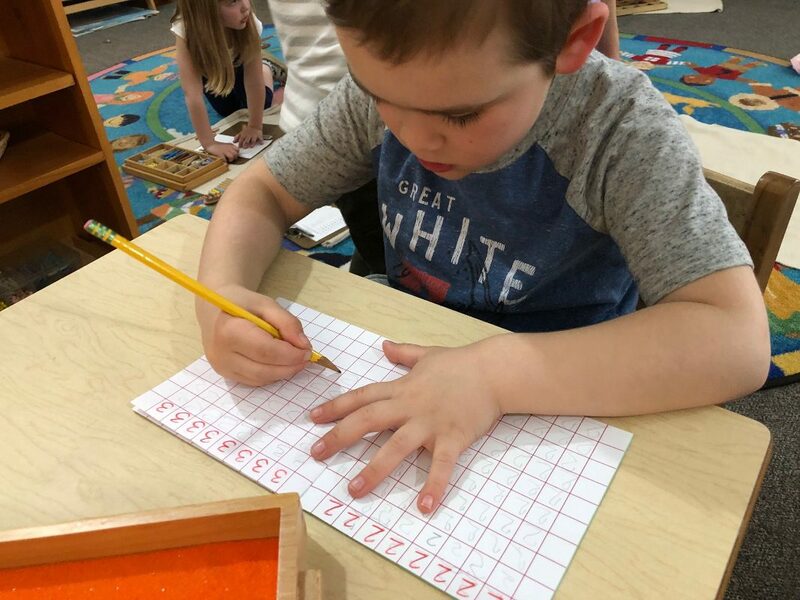 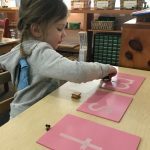 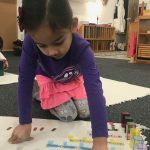 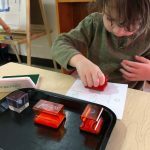 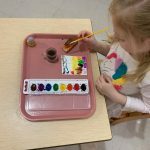 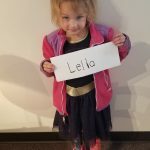 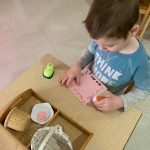 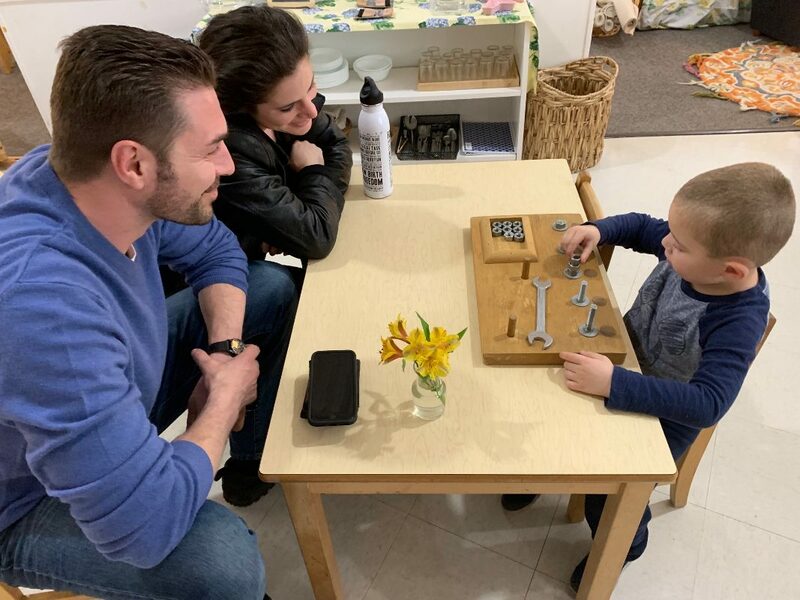 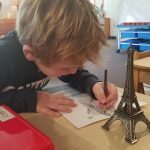 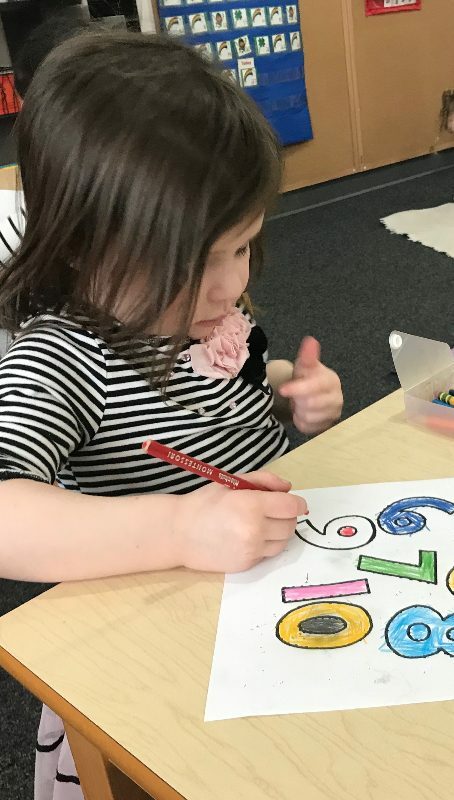 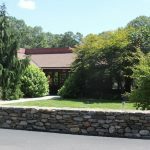 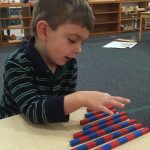 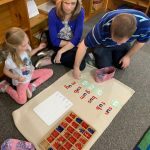 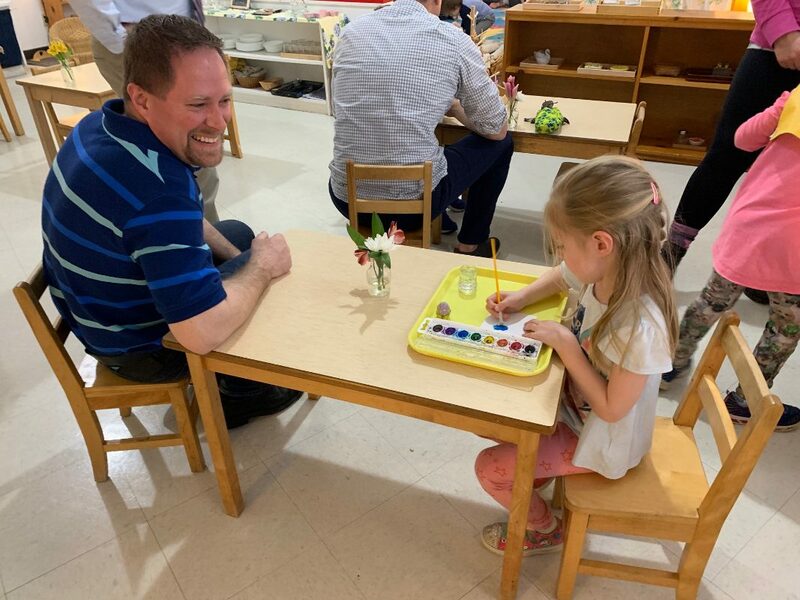 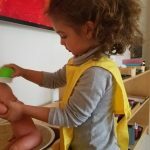 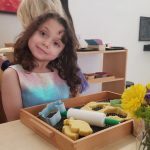 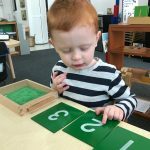 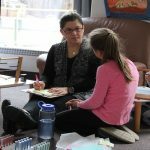 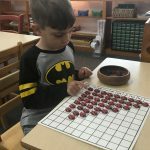 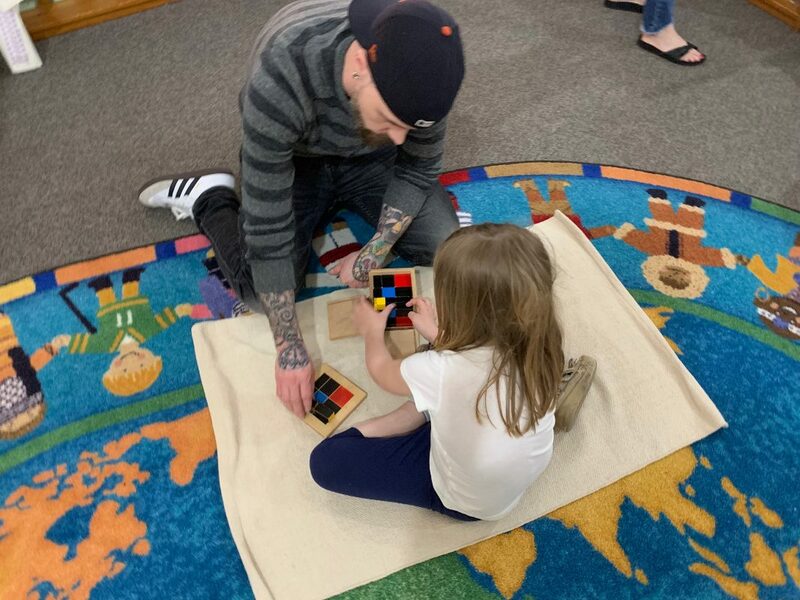 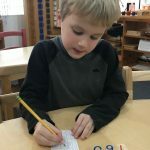 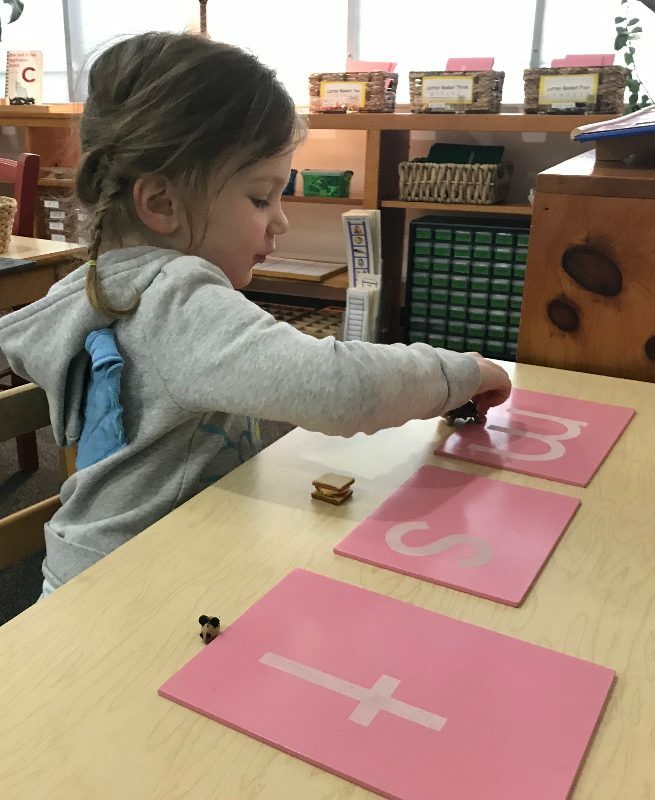 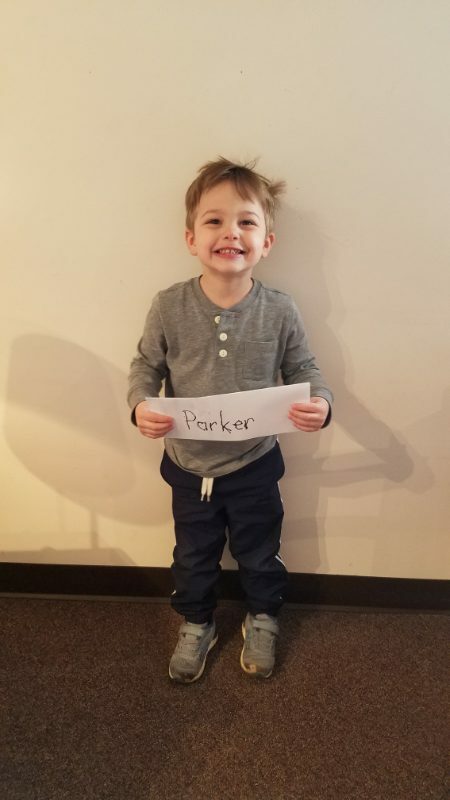 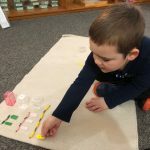 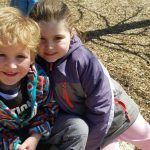 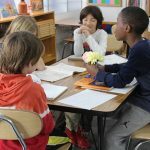 It is strange to look back at the pictures from the first few weeks of school and see how much they have truly grown, both psychically and intellectually. 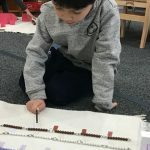 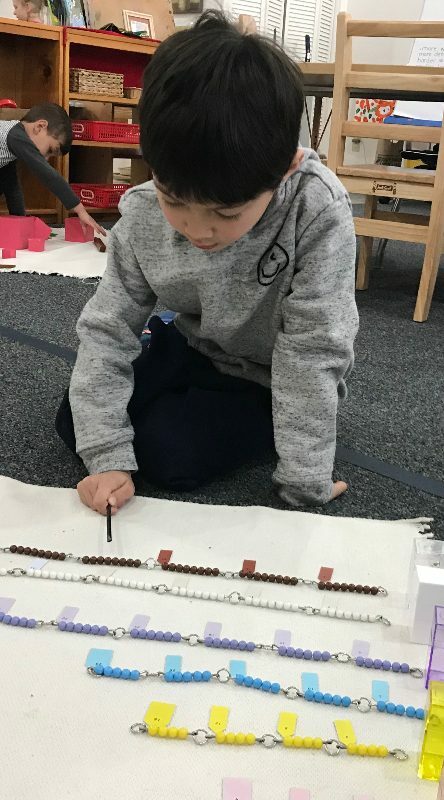 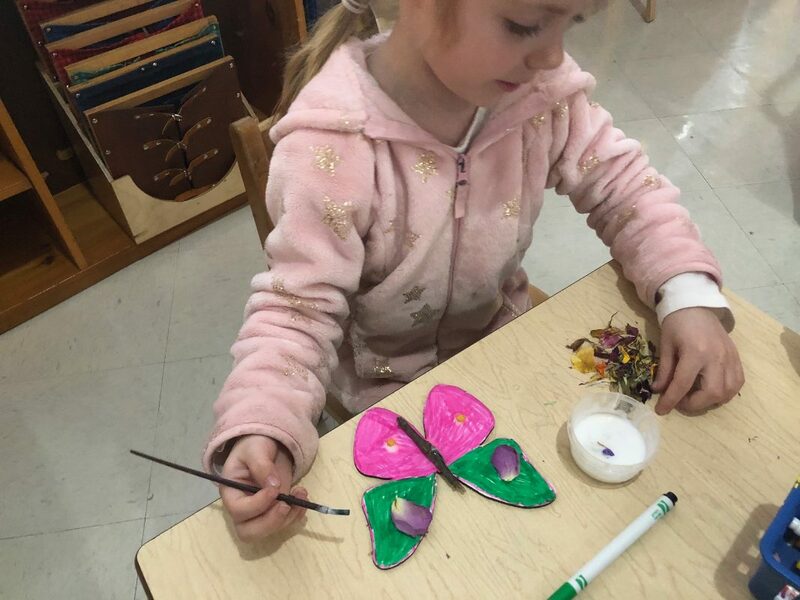 The beautiful change that has been occurring in our classroom is like that of the caterpillar into a butterfly. 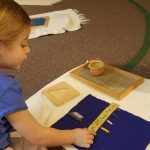 With patience we have sat back and watched these incredible beings learn and grow and ultimately, change into who they are today. 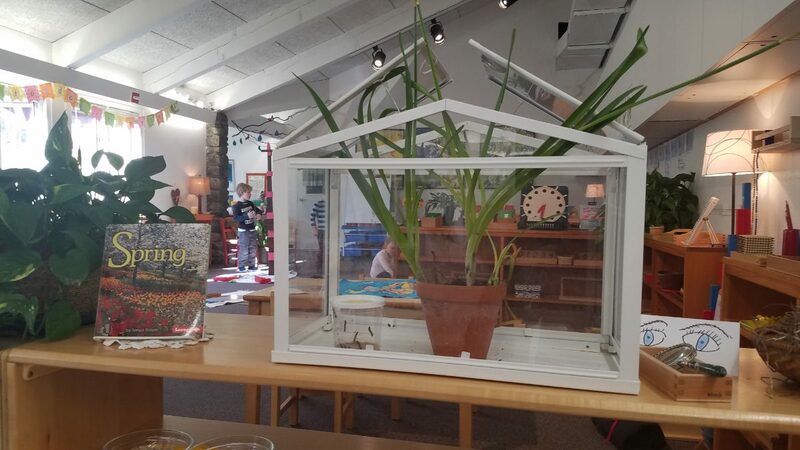 The children have luckily been able to witness this amazing transformation themselves, but through a magnifying glass. 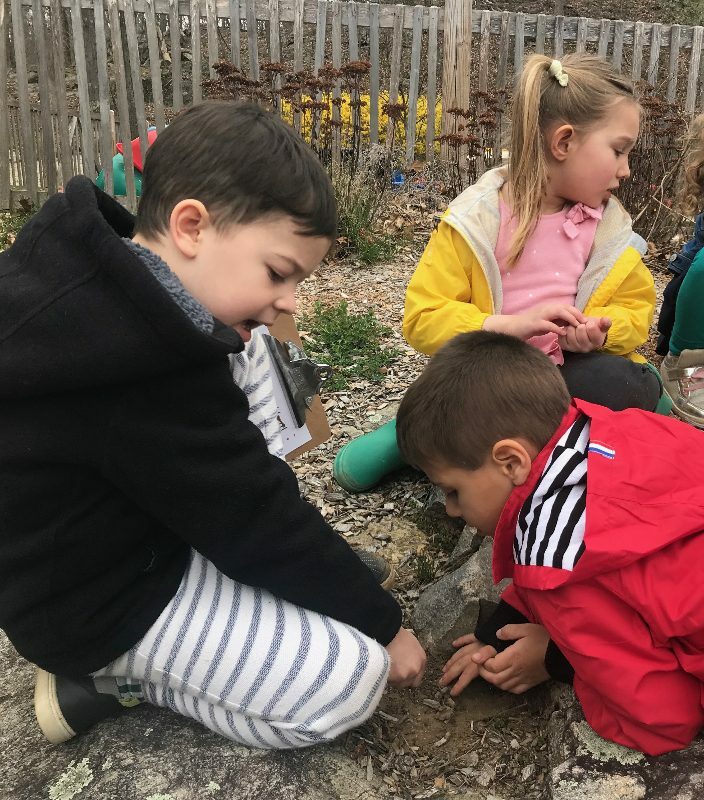 We have watched patiently as our caterpillars have grown, preparing themselves for the beautiful transformation they are about to make. 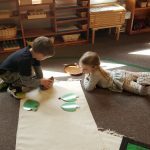 This week our caterpillars have entered into the final stages before emerging as a butterfly, the chrysalises. 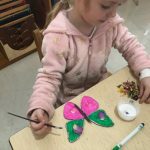 The children have spent many days learning about the magic of this transformation, and are eager to see when our butterflies will join us! 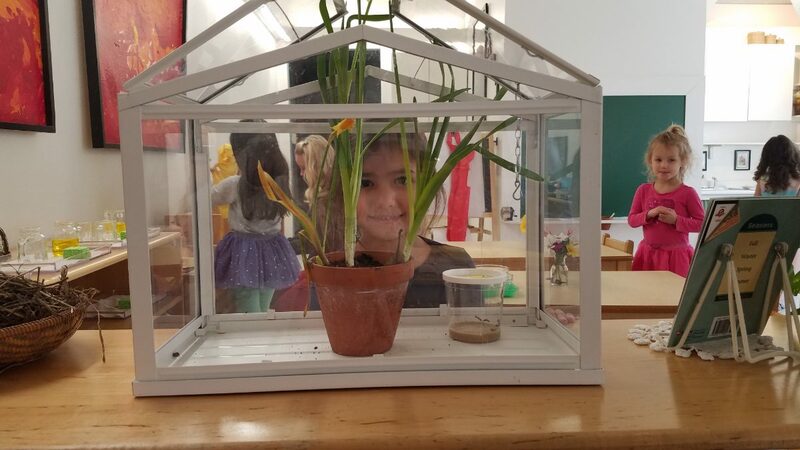 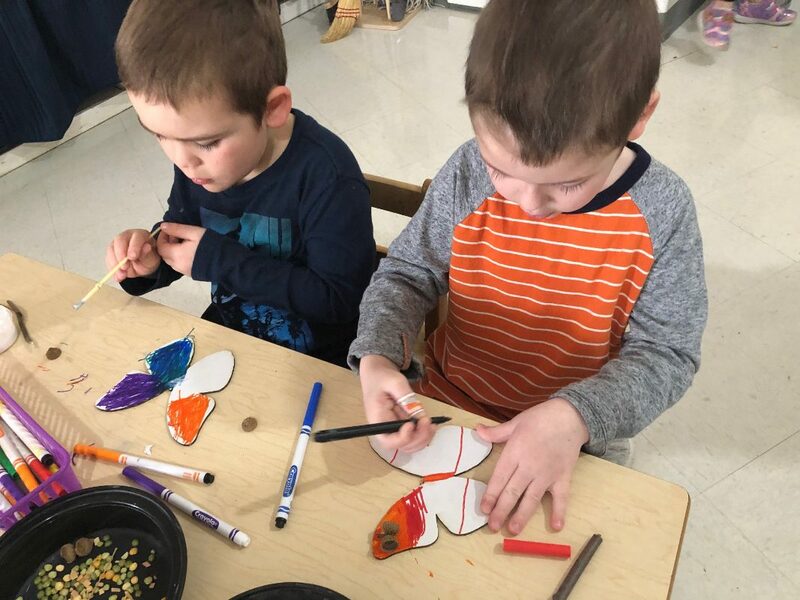 Another special thanks to our amazing art teacher, Mrs. Reid, for a project that combined nature and art, allowing the children to explore and experience all the amazing gifts our world has to offer us. 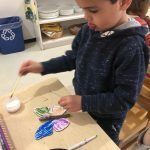 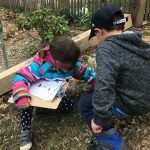 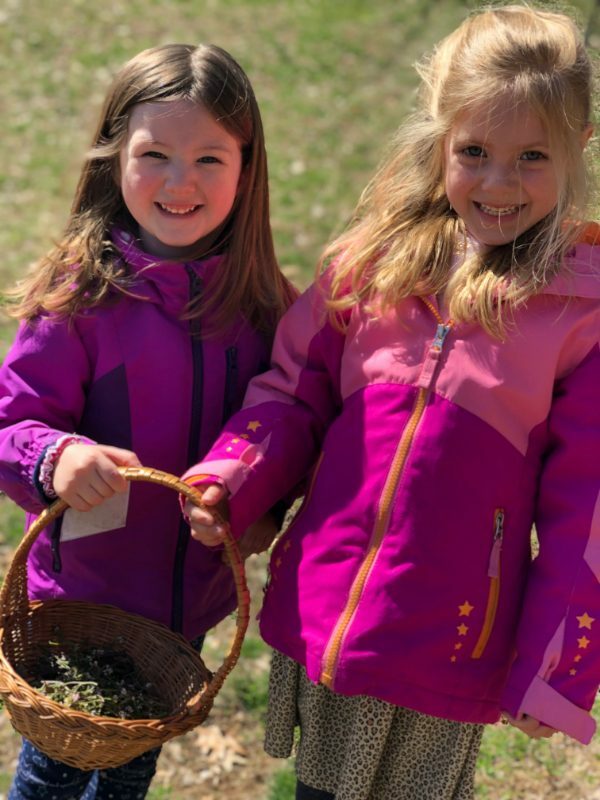 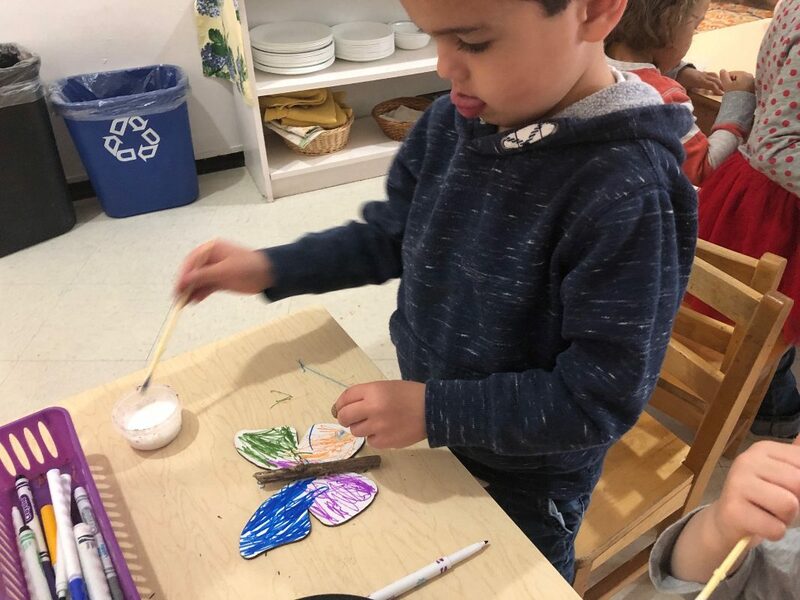 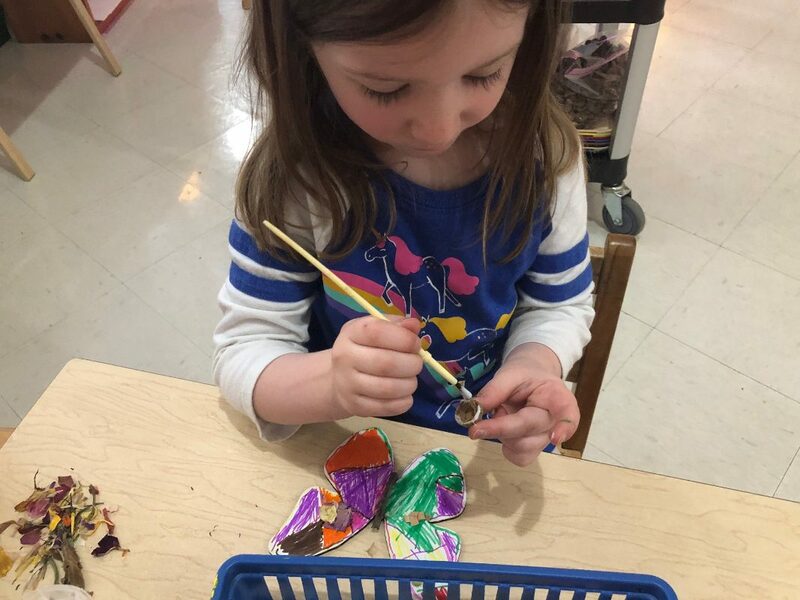 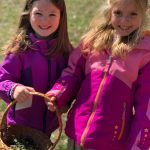 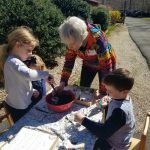 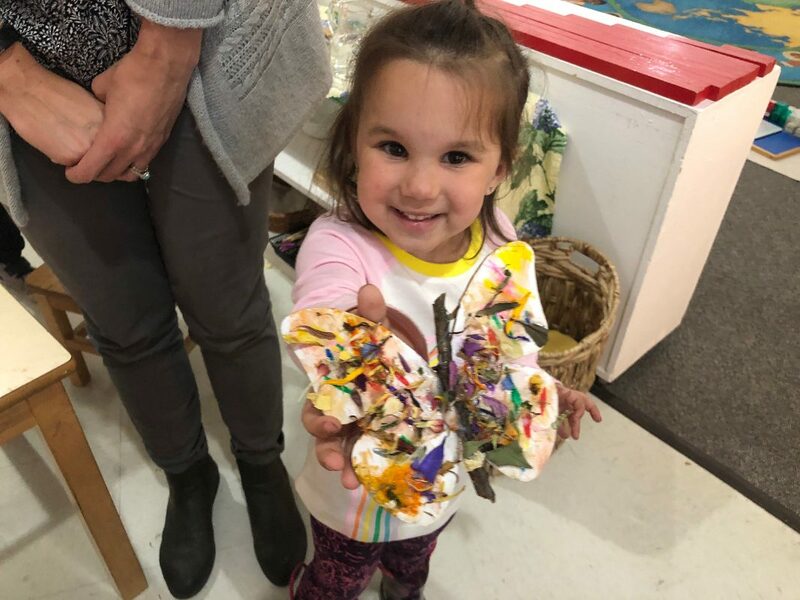 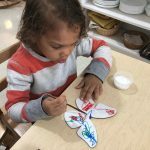 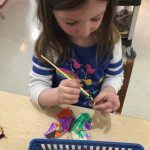 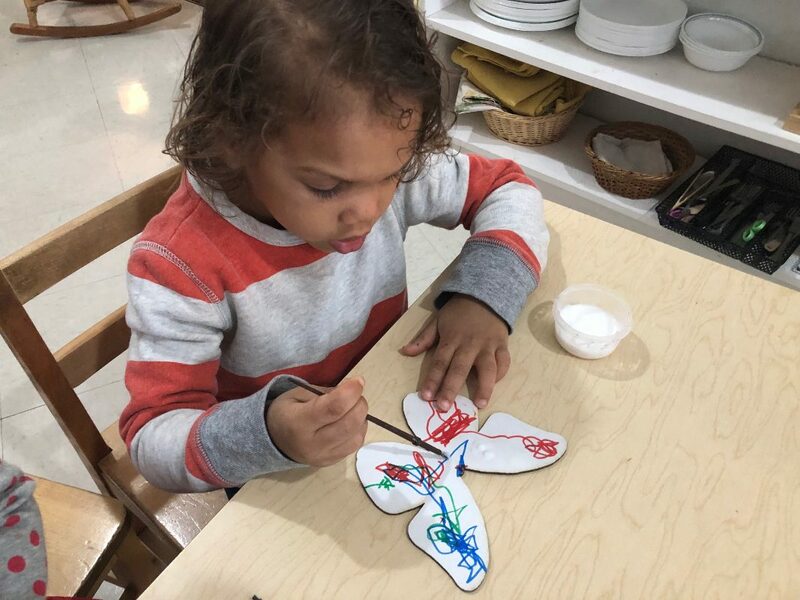 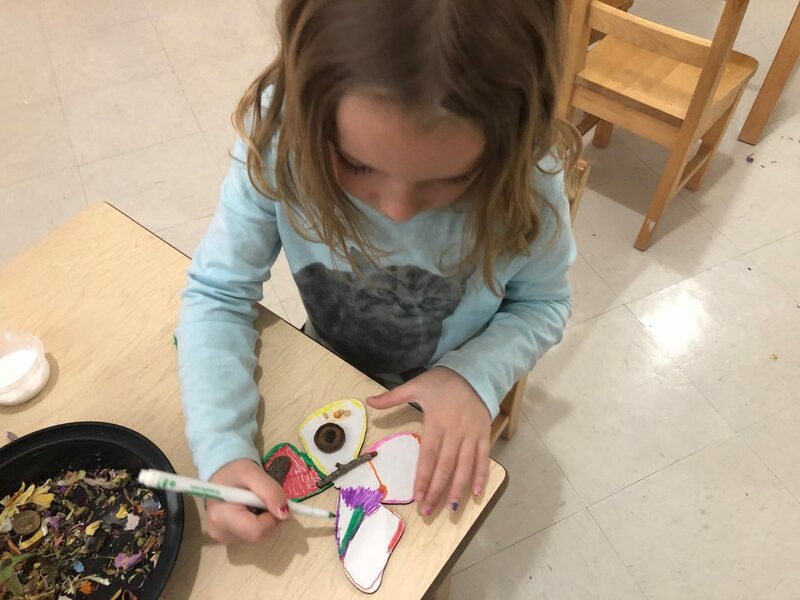 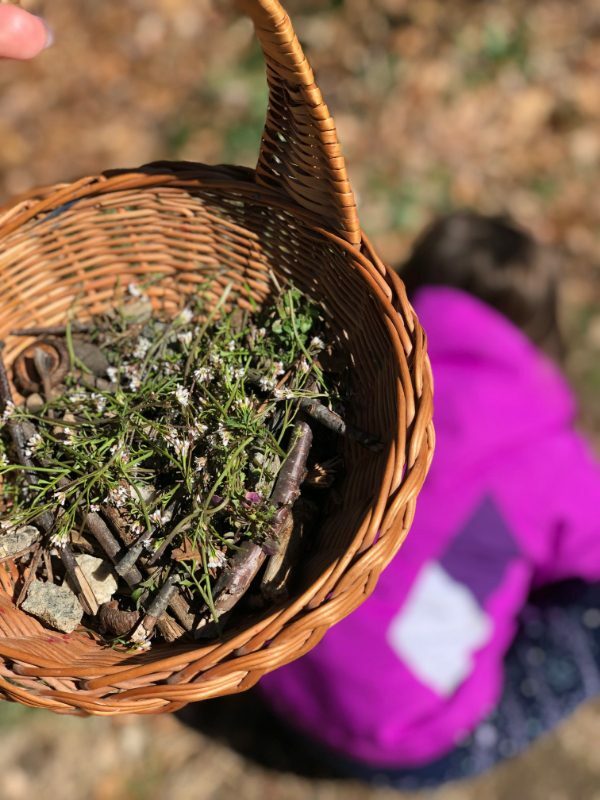 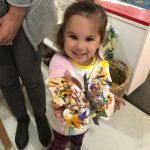 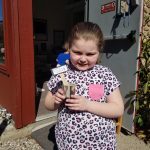 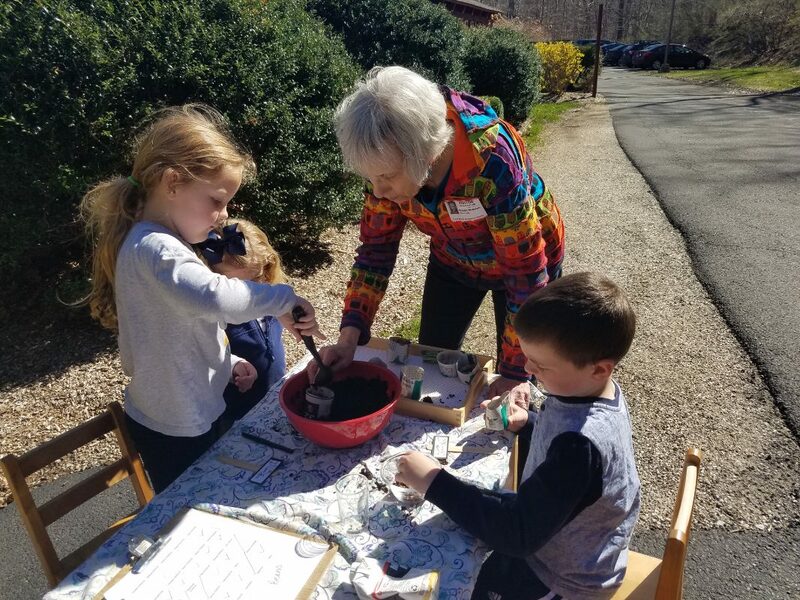 The children got to spend the afternoon outside scavenging for sticks, flowers, and other natural art supplies to use to create stunning butterflies. 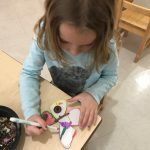 The outcomes were breathtaking! 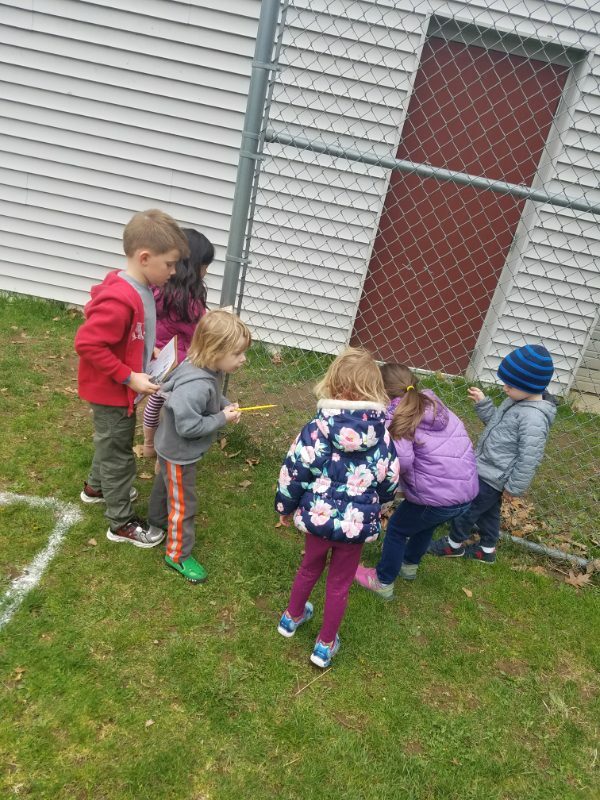 Mrs. Doyle’s Class: Head, Thorax, Abdomen! 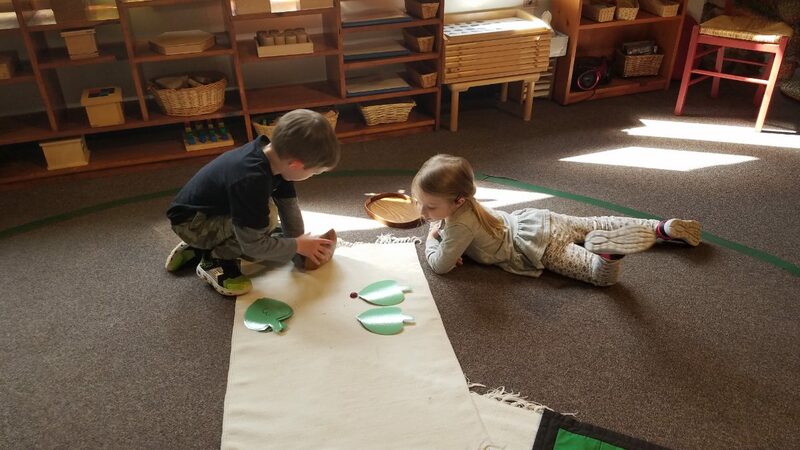 We are hard at work becoming entomologists. 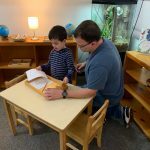 This is always a favorite unit of study for the children. 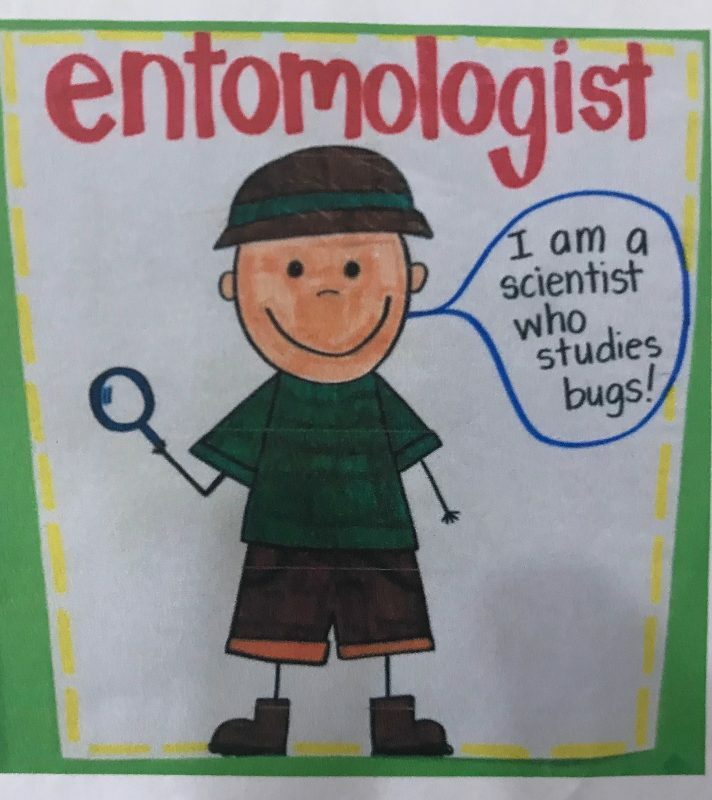 An entomologist is a scientist who studies insects. 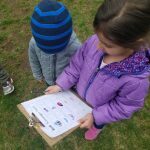 We began our unit by reporting on what we already know about insects, what they are and what they can do. 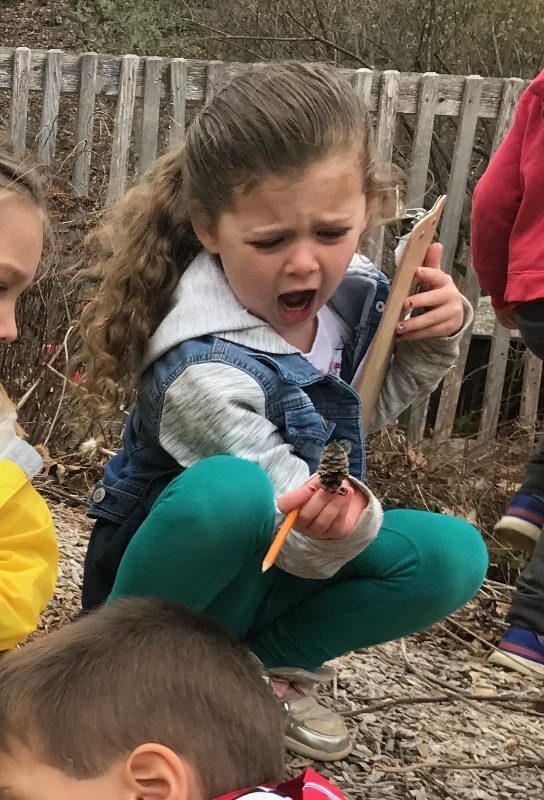 This week as a class, we discovered that insects are slimy, little, gross, soft, and hard. 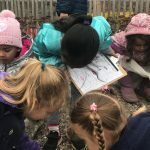 Insects can crawl, sting, bite, eat, fly, walk upside down, and jump. 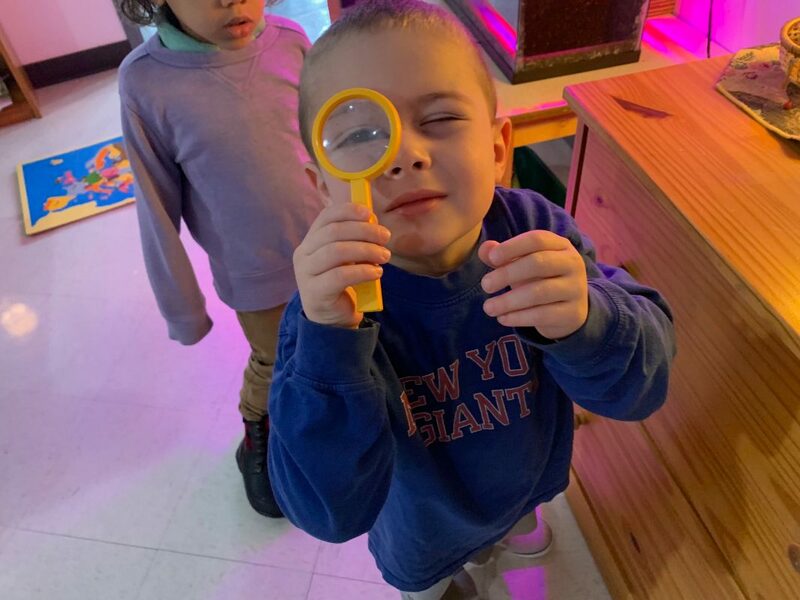 We learned that insects lay eggs, have antennae, three main body parts, a head, thorax and abdomen, eyes, and six legs. 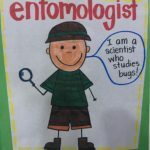 Insects are also cold blooded, have an exoskeleton, and many have wings. 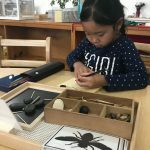 We found out why a spider is not an insect. 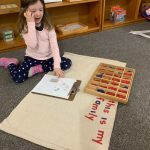 Ask your child to see if he or she knows. 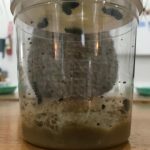 We also welcomed five tiny caterpillars to our classroom. 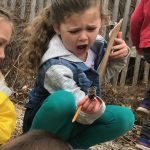 It is so exciting to observe each step of the fascinating life cycle of the Painted Lady Butterfly. 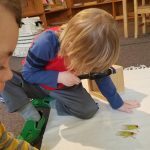 Right now our caterpillars are busy eating, spinning silk and growing bigger every day. 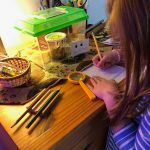 During this incredible period of growth, they will shed their exoskeletons four times and grow more than ten times their original size! 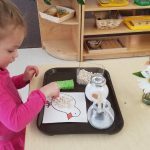 When they have finished growing, the caterpillars will climb to the top of the cup. 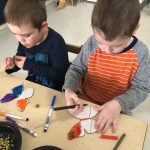 Once there, they will hang from the paper disk in a “j” shape under the lid. 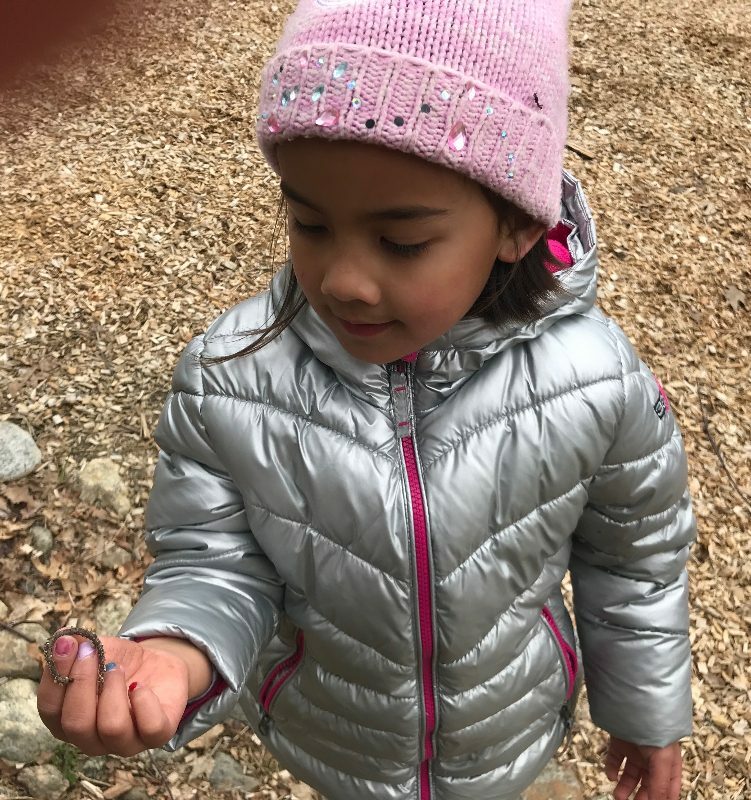 They will shed their exoskeletons one last time before they pupate and form a chrysalis. 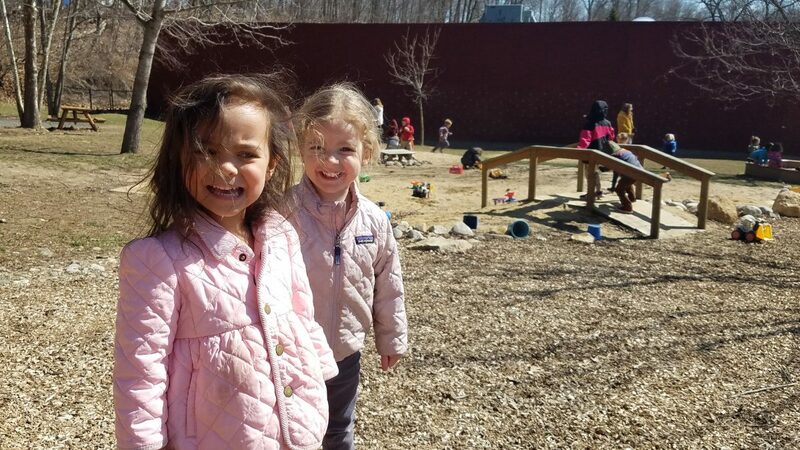 Although the temperatures have been slightly chilly for what we think of in Spring, our hearts have welcomed the sun shining and the world opening up all around us. 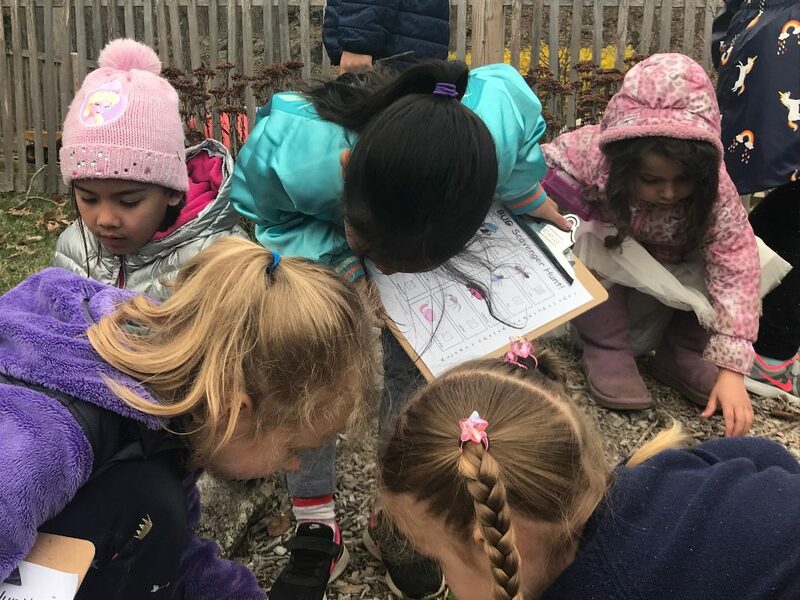 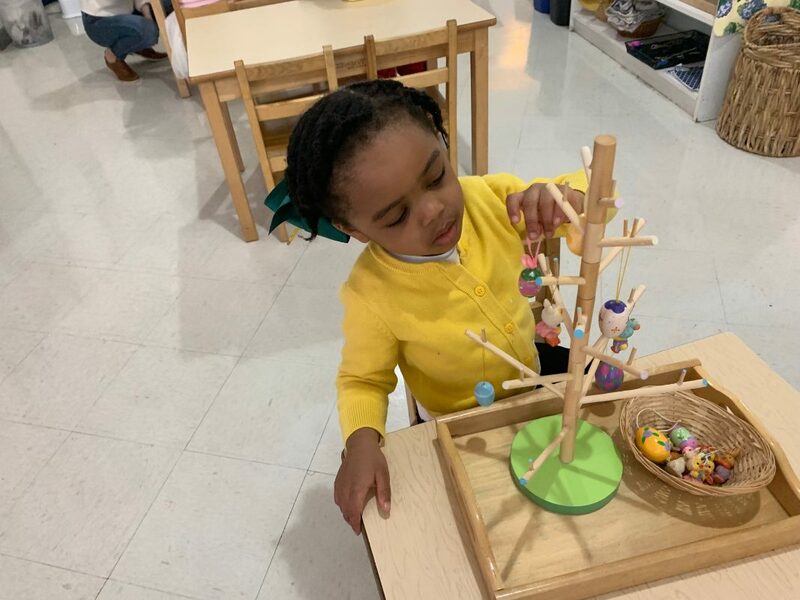 The children themselves are blooming as they discover new and exciting things about their world. The sprouting of our carrot seeds and the arrival of our caterpillars has sparked an astounding interest in nature among our students. 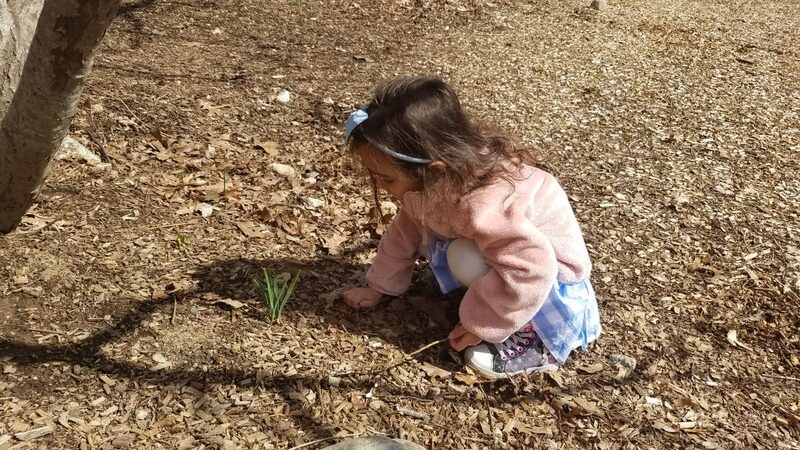 That is why as mother nature wakes up from her winter slumber, we will be closely following her lead, experiencing every moment that this beautiful season has to offer us. 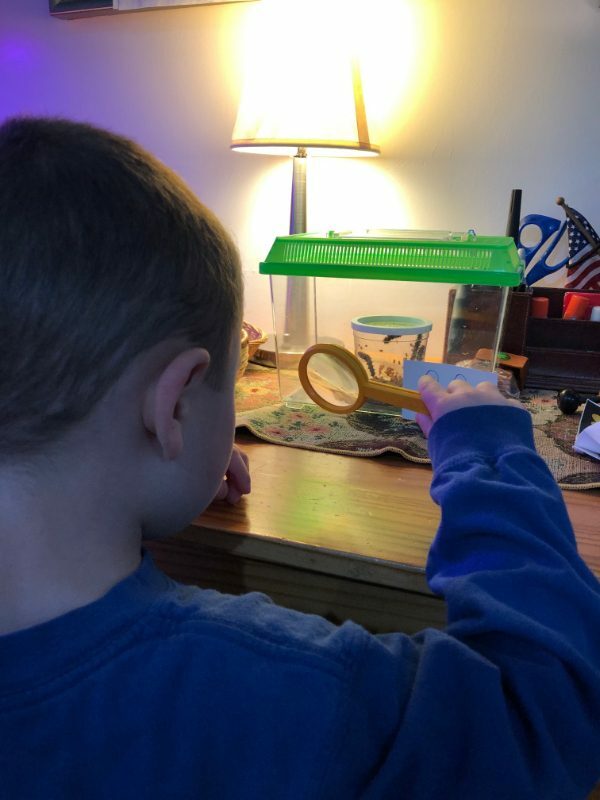 The children are enthralled by the arrival of our caterpillars and are anxious to observe the metamorphosis our butterflies will experience to become the graceful insects we love. 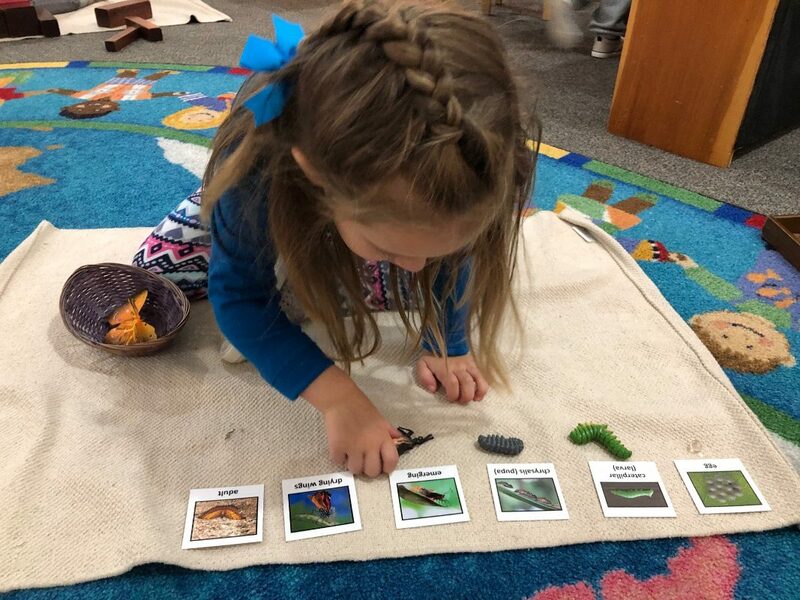 From the egg to the caterpillar and the chrysalis to the adult, learning about the life cycle of a butterfly is exciting. 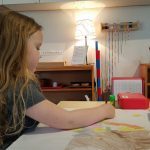 This week we have been busy. 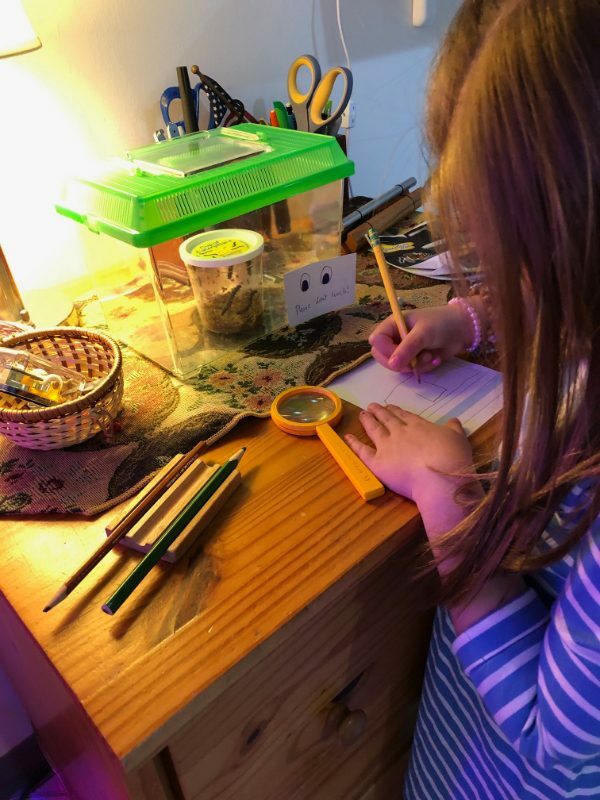 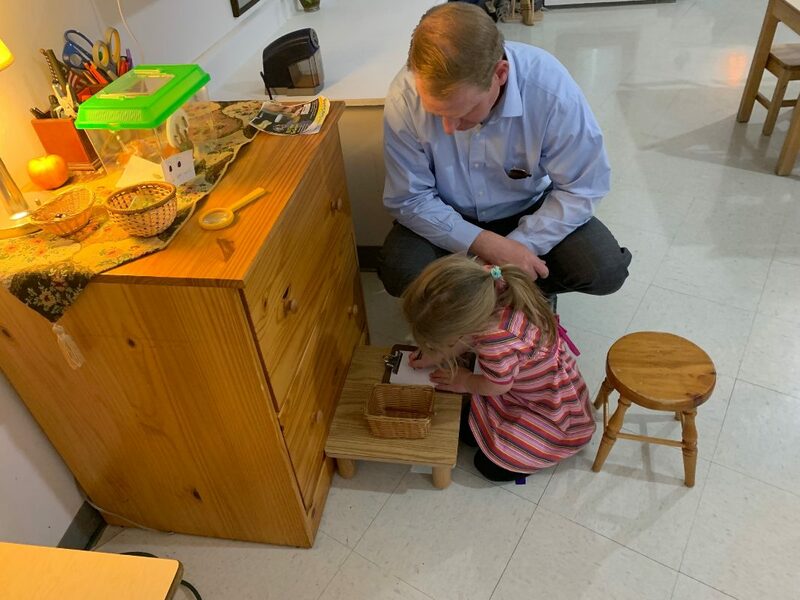 Your little entomologists have been learning about metamorphosis on a deeper level, fully involved in watching the process occur. 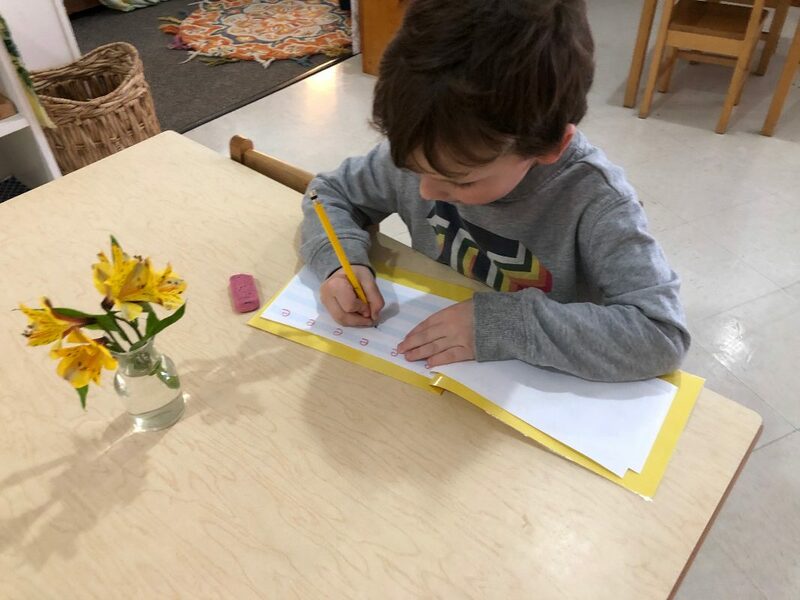 We have entered our first journal entry into the class butterfly journal, recording changes as the children notice them in the habitat. 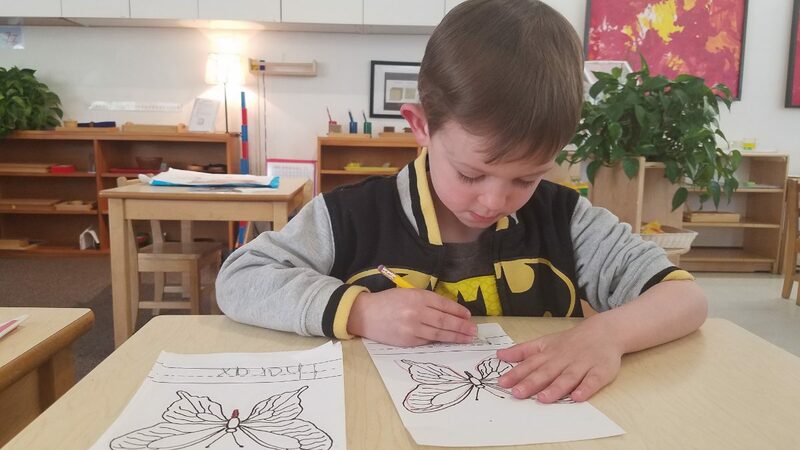 We are learning the new vocabulary words life cycle, chrysalis, and metamorphosis, reading butterfly stories, using butterfly writing prompts, and singing butterfly songs. 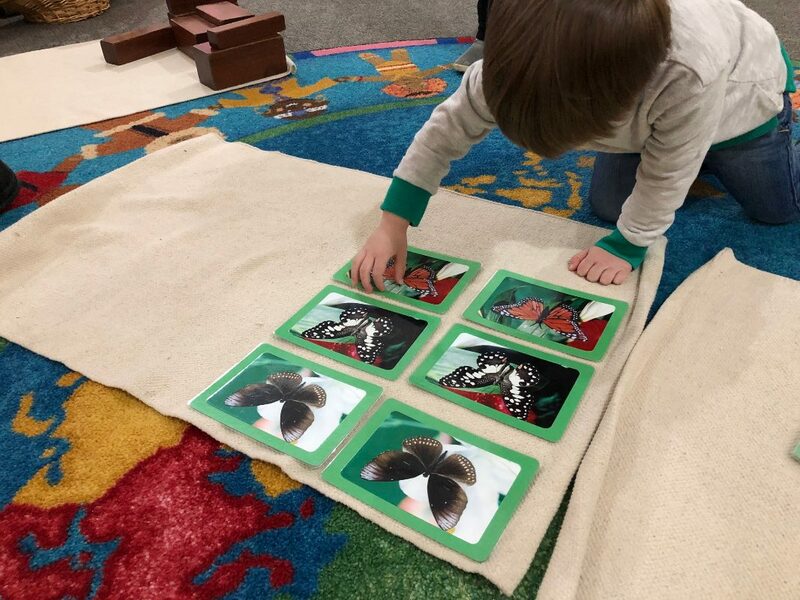 We will continue to watch and enjoy this amazing metamorphosis…both the butterflies’ and your children’s.